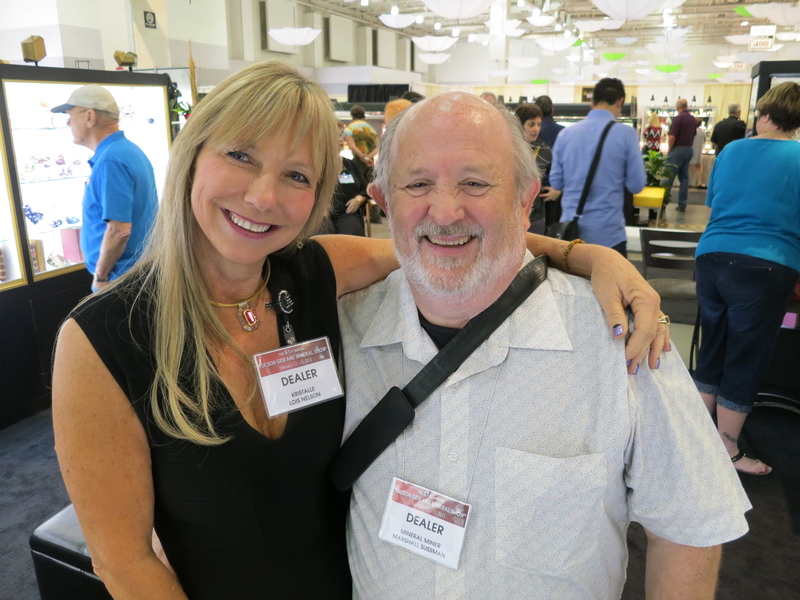 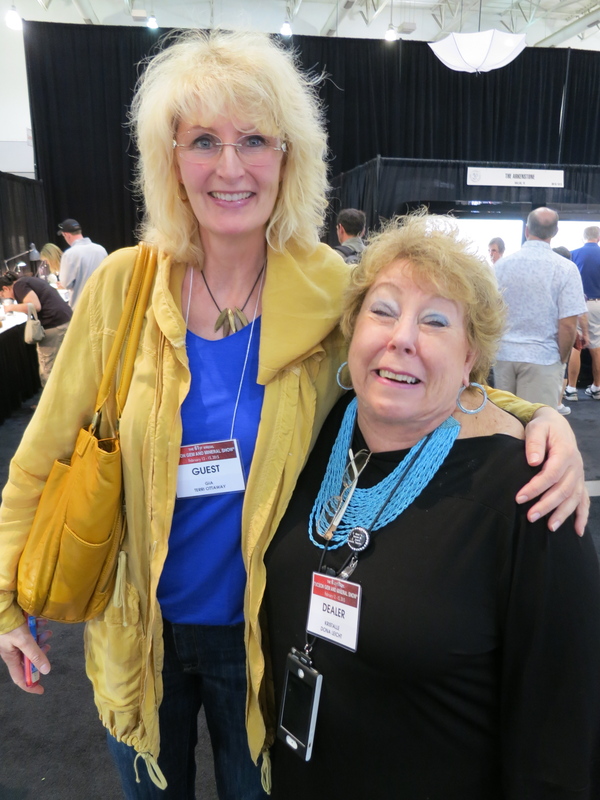 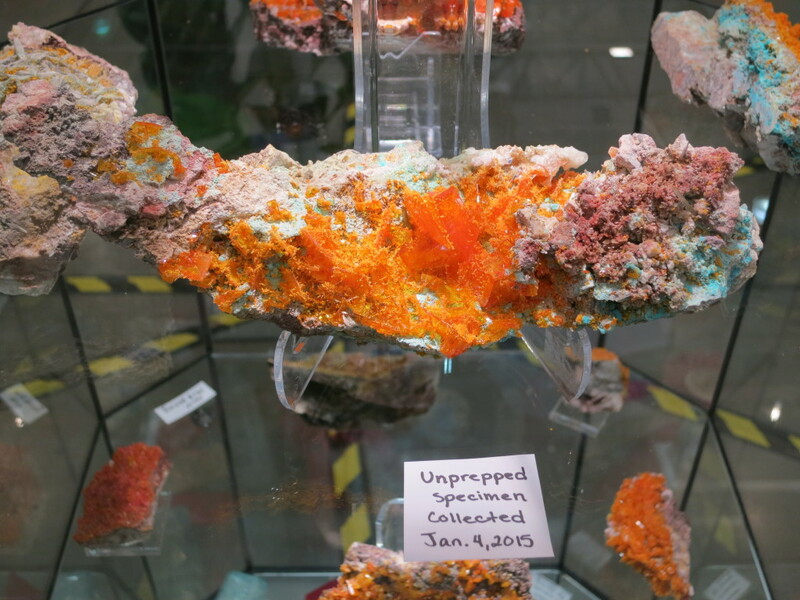 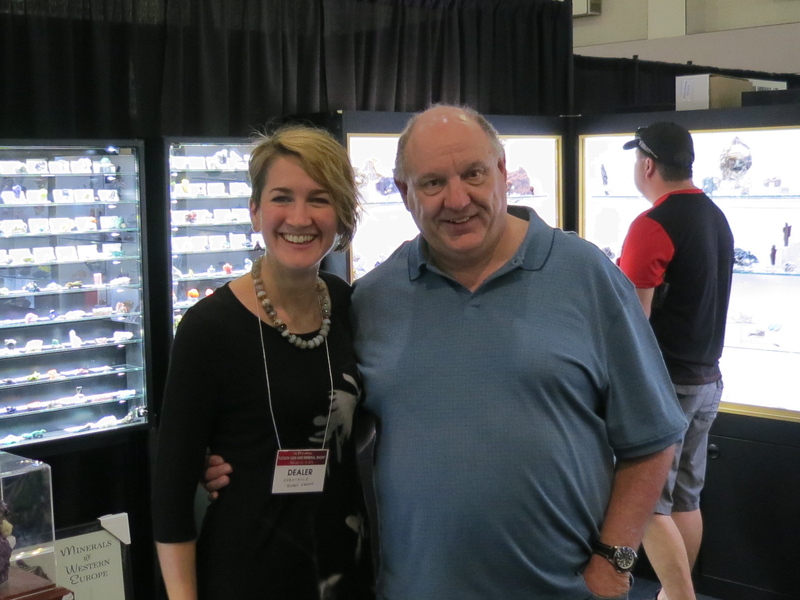 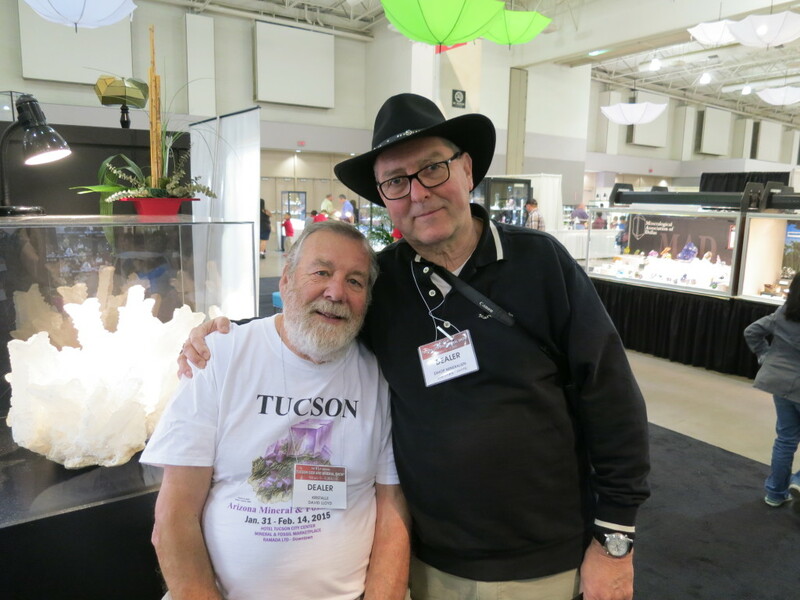 In our second report from the Tucson Gem and Mineral Society Show we bring you photos of the special displays and also specimens and new finds from around the show. 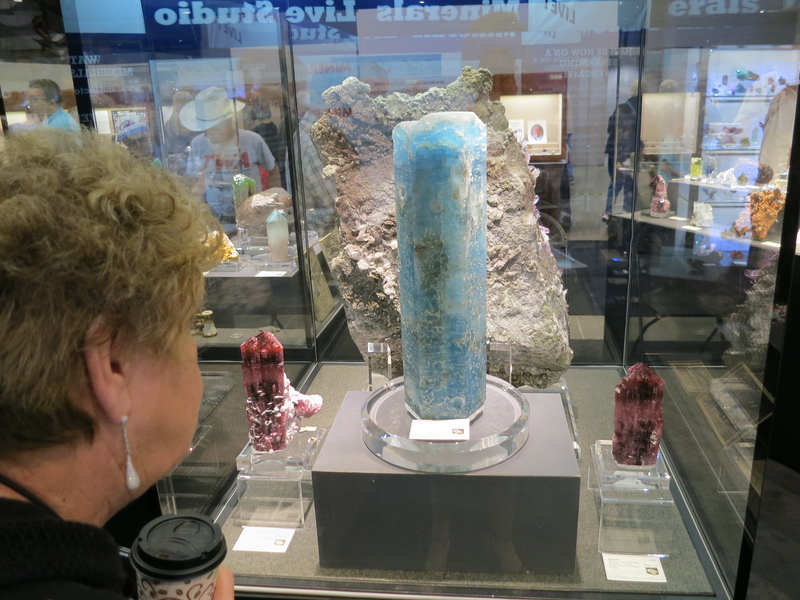 Friday morning is always children’s morning, with many groups of school children visiting the show. 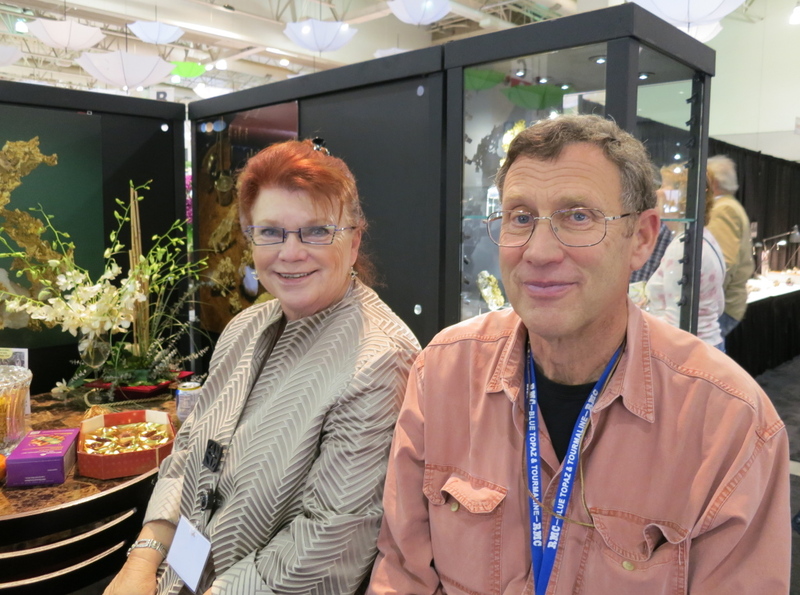 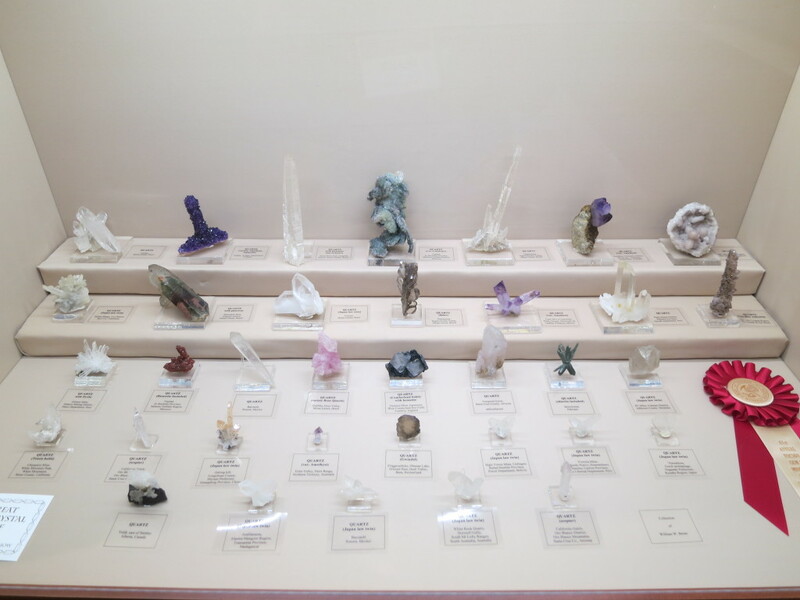 These are tomorrow’s collectors, and we encourage them to come into the booth and see the minerals. 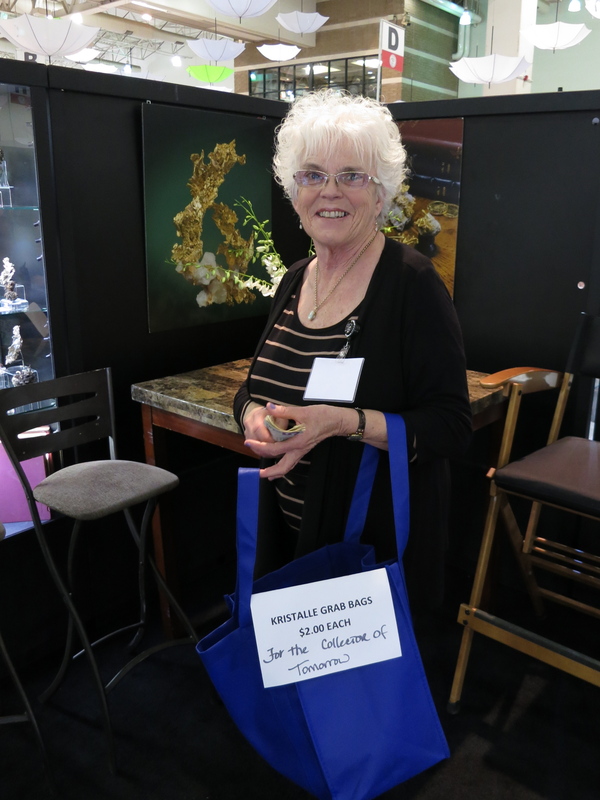 We bring along ‘grab’ bags for the children with a surprise mineralogical item in each, which are a great hit. 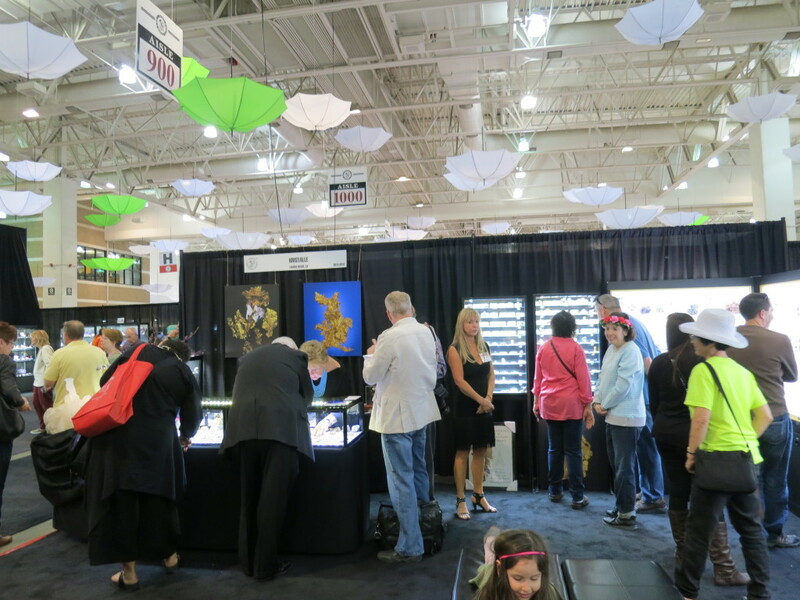 The Collector’s Edge always have an impressive booth, this year including two crystal chandeliers hanging from the convention centre roof. 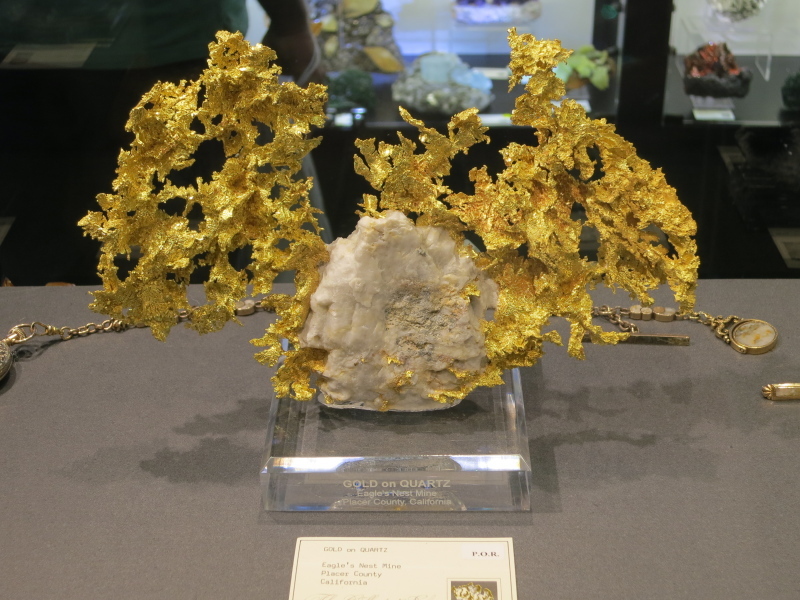 As well as their many new finds they had some superb Native Golds on display. 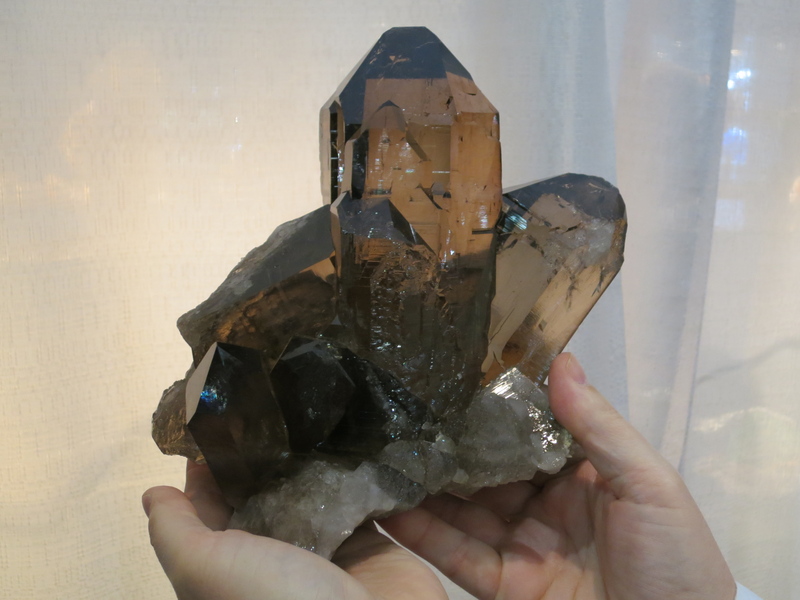 Alain Martaud had several lovely Smoky Quartz specimens found at the end of Sept 2014 in the Tour Noir Glacier, Chamonix, France. 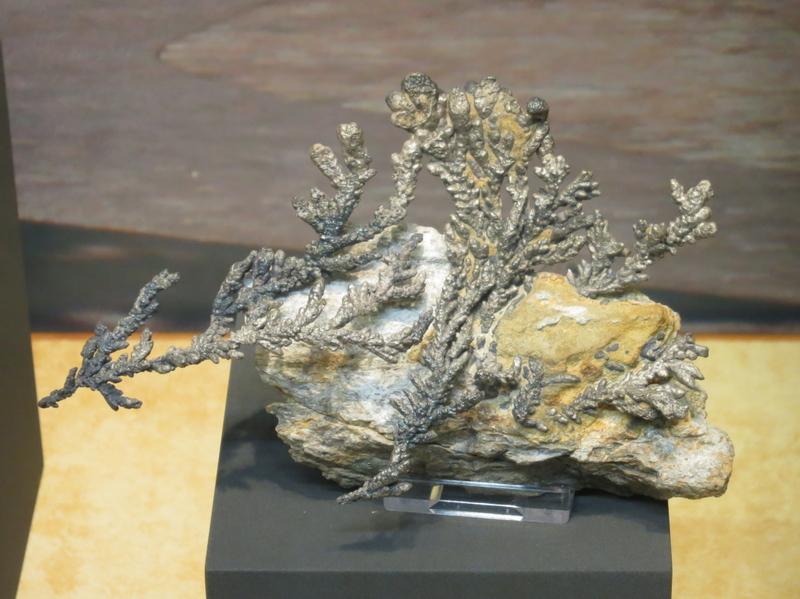 The discovered pocket was quite big, around 2 metres and approximately 150 specimens were recovered. 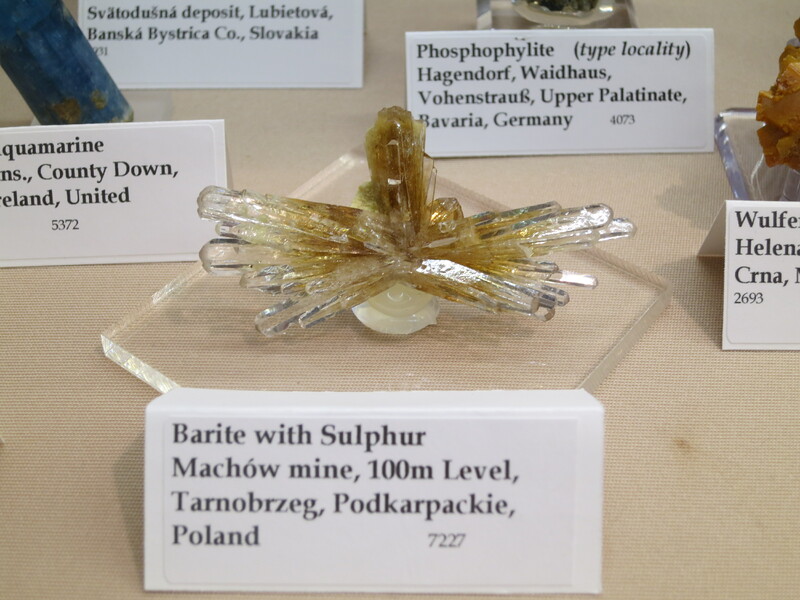 However only six specimens (all found in one corner) were of high quality with superb colour, lustre, gemminess and no damage. 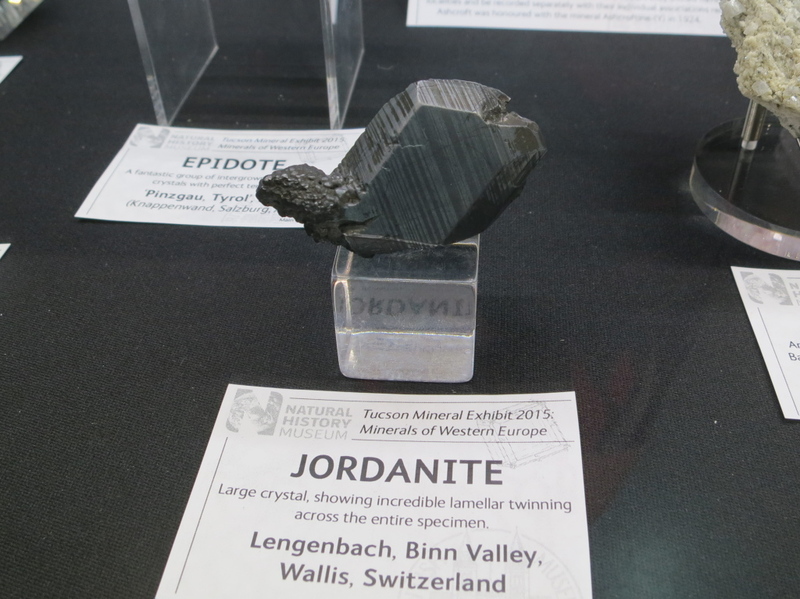 Alain had 5 of these on display. 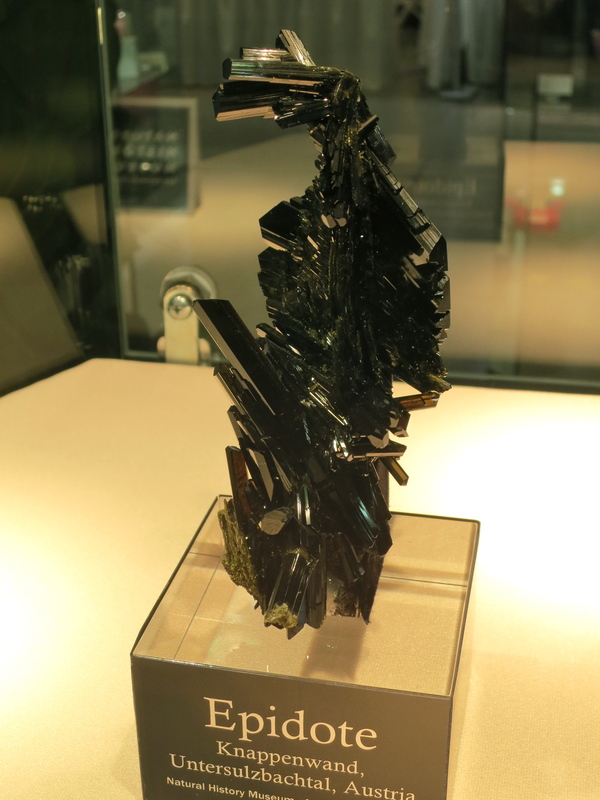 Here is one of the best, held by Alain for scale. Pretty impressive. 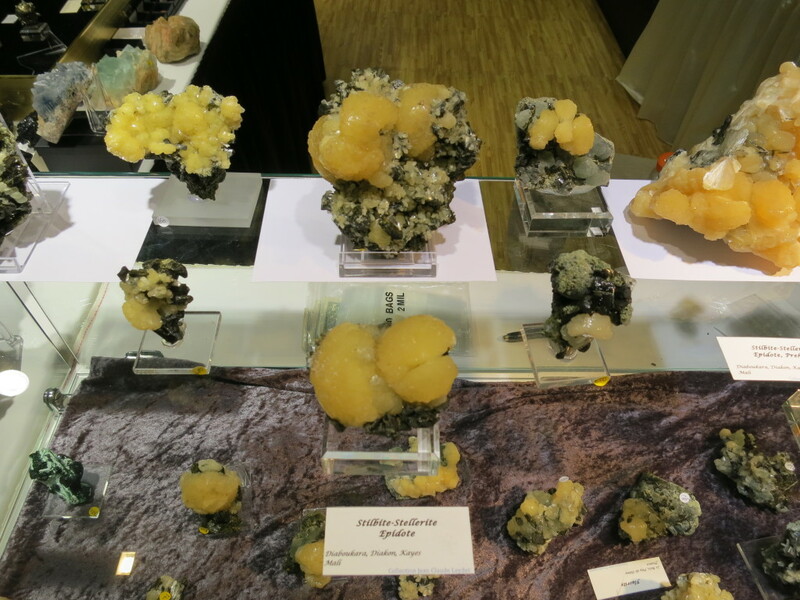 There were a several new finds around the show – more of the new Ce-rich blue Beryls from Pakistan that we reported on at Munich last year, Epidote in Quartz from Brazil, and these attractive Stellerite, Stilbite and Epidote from Diaboukara, Kayes, Mali, in the booth of Jean Claude Leydet. 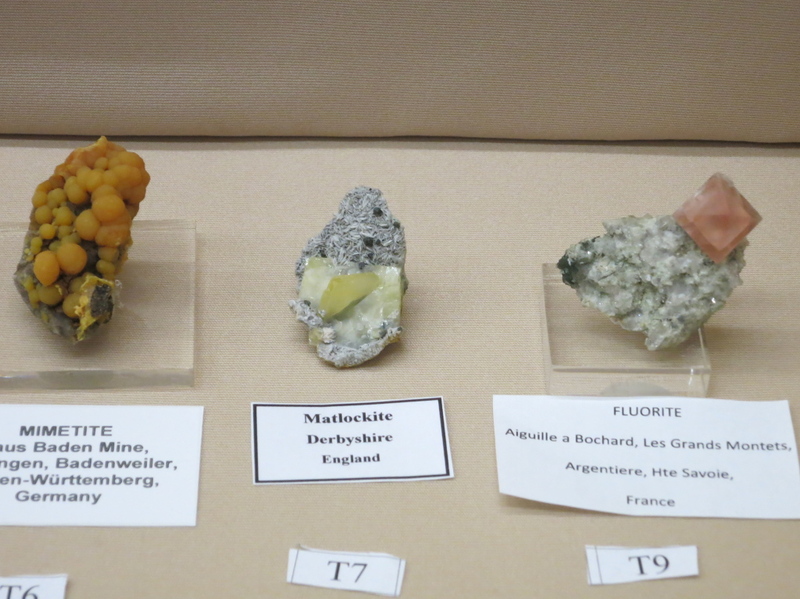 These were mined in the last two months, the most recent were found just two weeks ago. 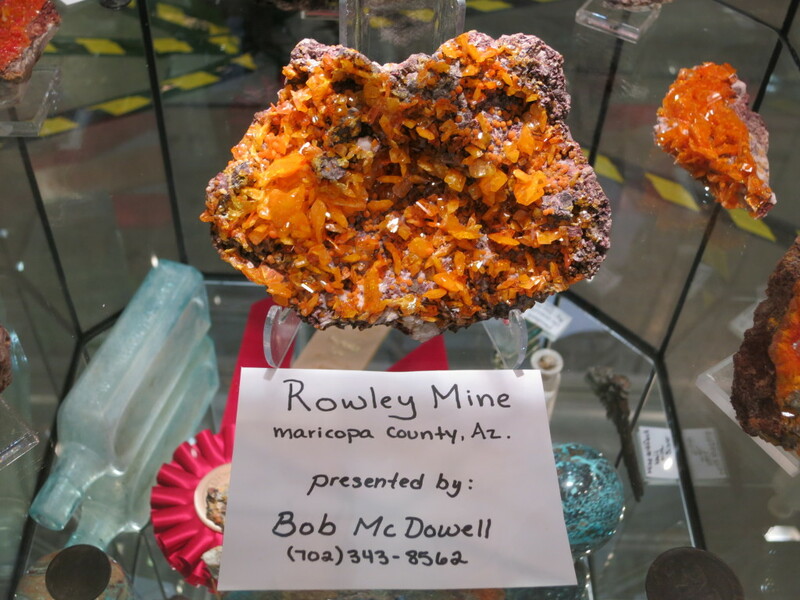 There was a cabinet of new vibrant orange Wulfenite from the Rowley Mine, Arizona. 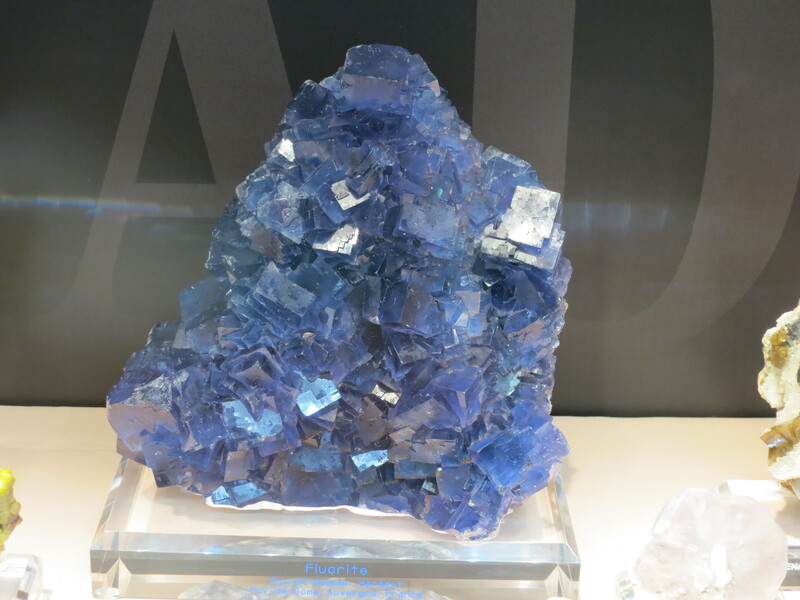 This piece was found just over a month ago, and has not yet been prepared – pretty impressive how they come out of the ground! 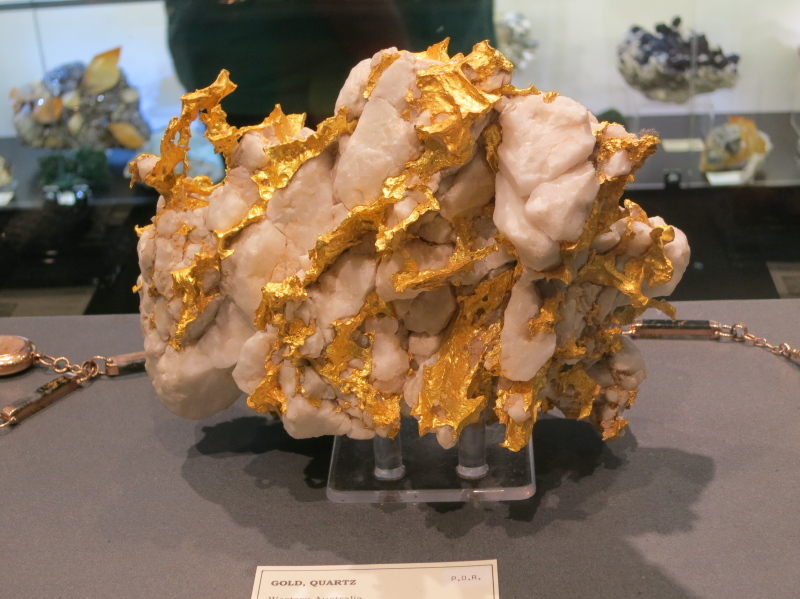 Just outside our booth was this huge Gold Nugget, with some crystallisation, from Mt Monger, Western Australia. 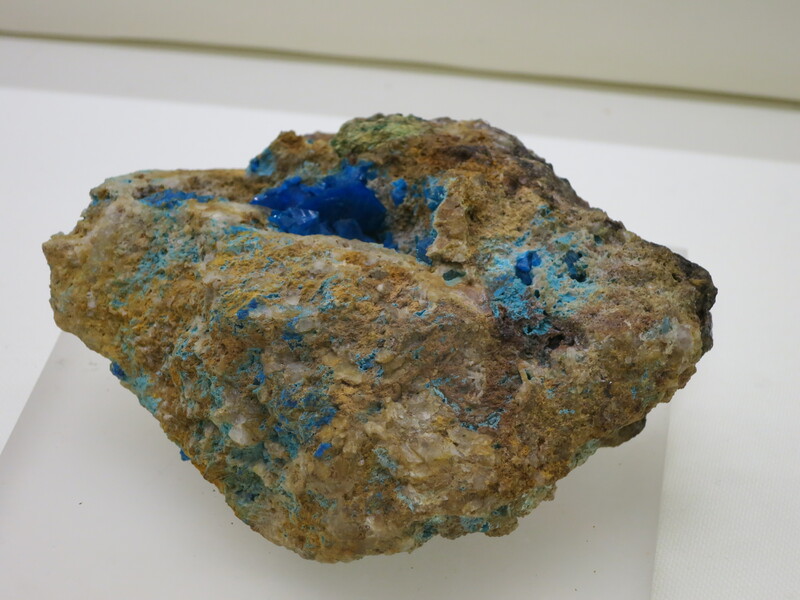 It was found in 2014, we believe by a metal detector which must have been quite the experience! 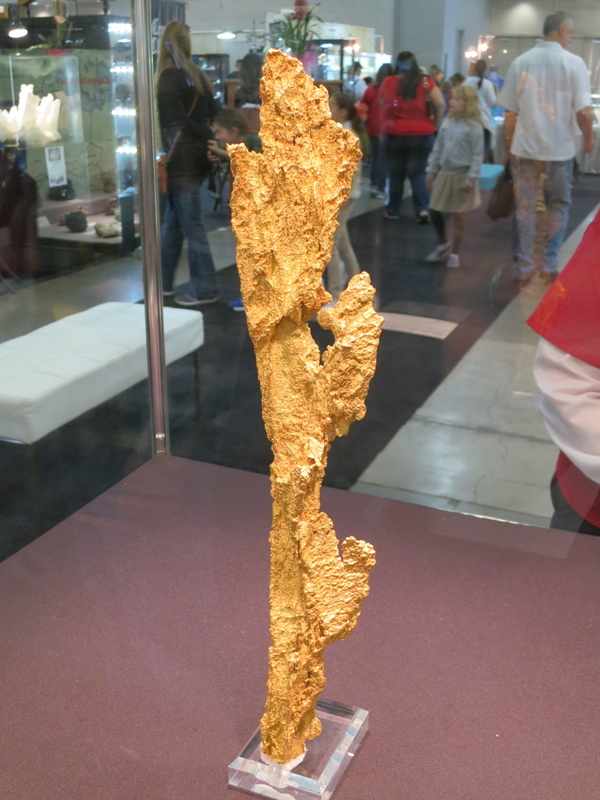 It weighs 117 Troy ounces or 3.6 kg. 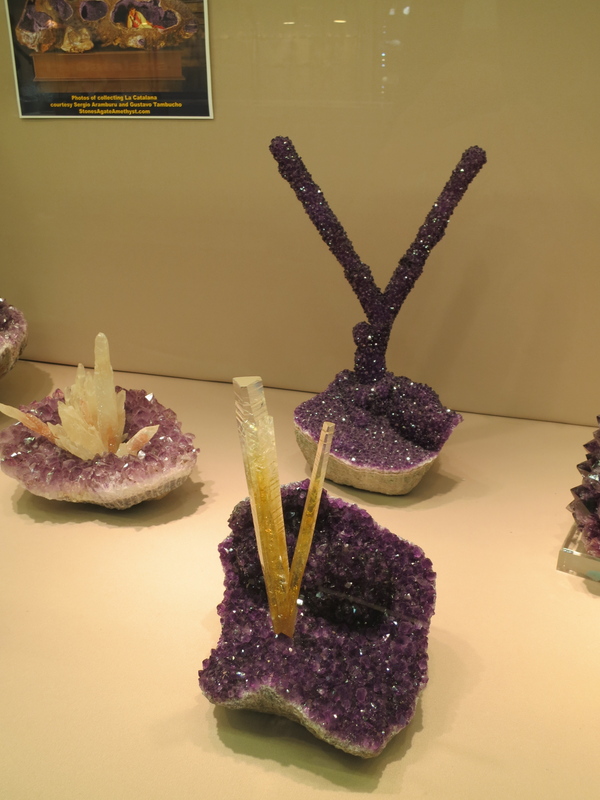 On our wanders we found Nicolai Medvedev with his special display. 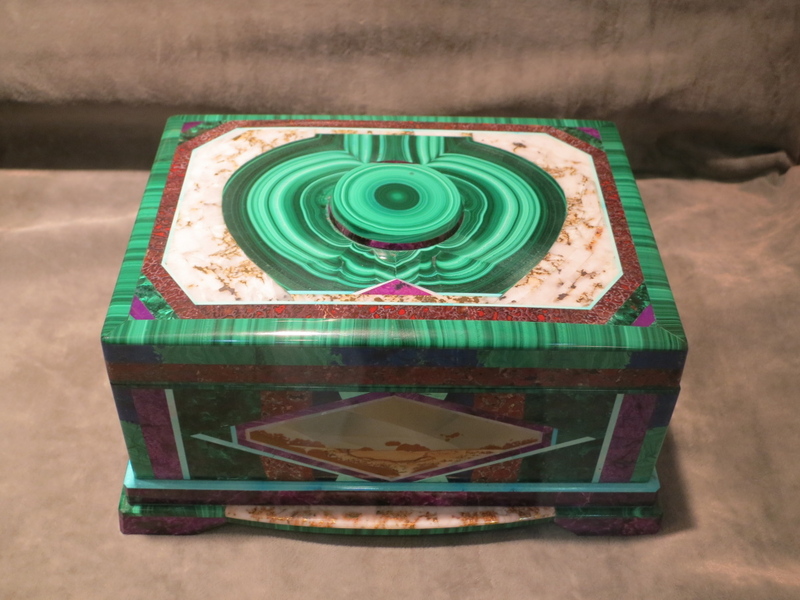 Nicolai creates the most beautiful inlaid objects, and had several boxes on display inlaid with Gold in Quartz, Malachite, Rhodochrosite and more. 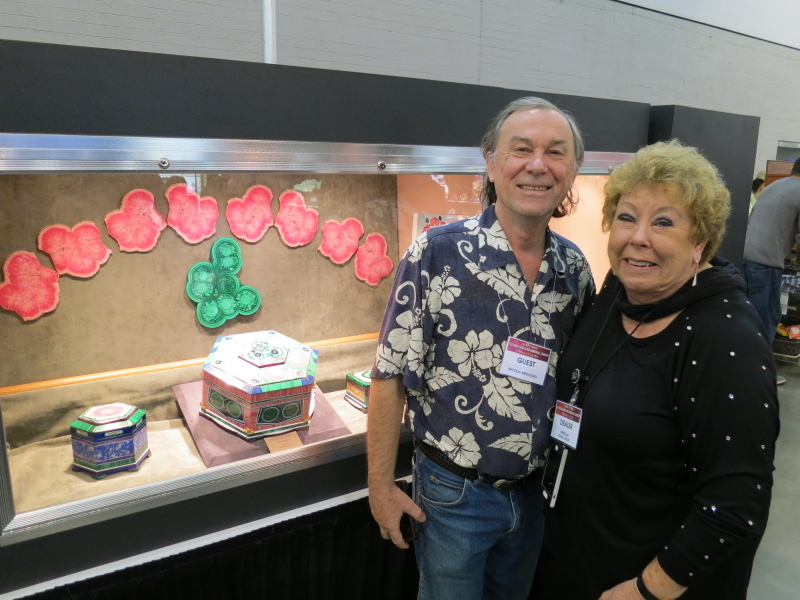 On the back of his case was several polished slices of pink Rhodochrosite and what is one of the best polished Malachite slices we have seen. 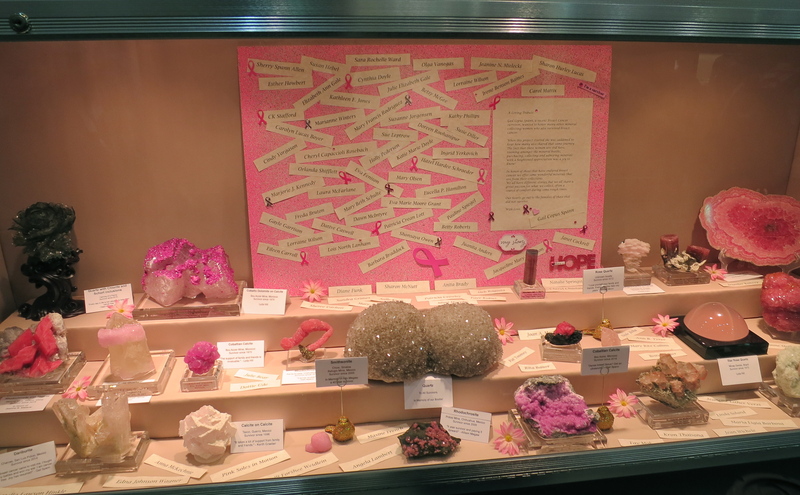 Gail Spann had a thought provocating display of pink minerals to celebrate her recovery from breast cancer and to honour women in the mineral business who have also survived. 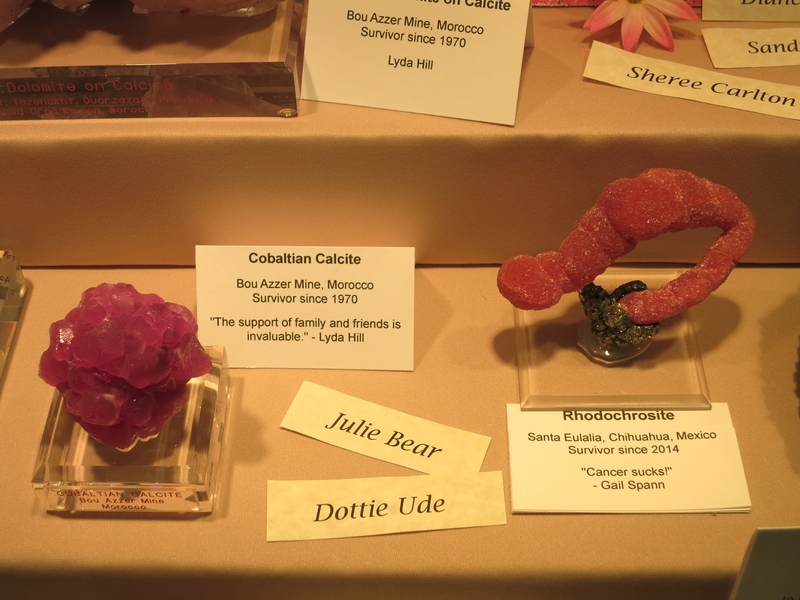 It is quite saddening there are so many names, even sadder to consider how many others did not survive, but it was lovely to see Gail looking so well at the show. 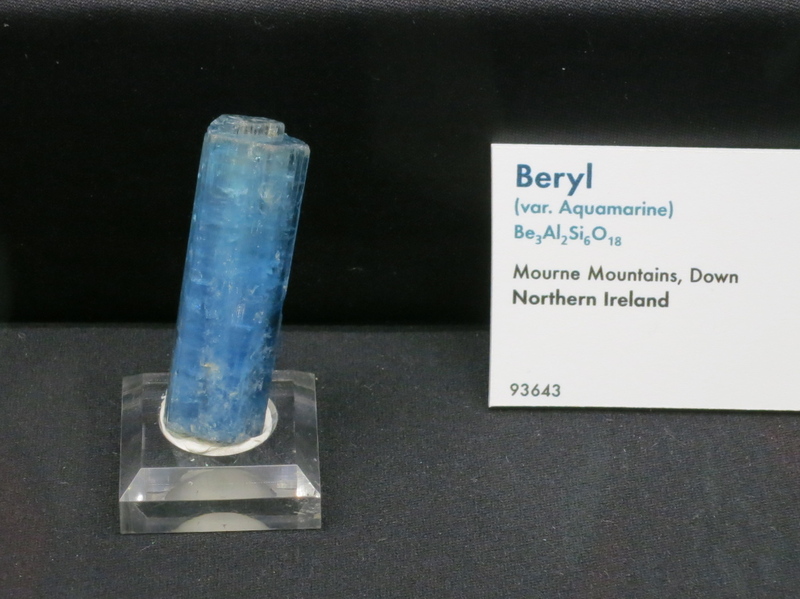 Dealer Marcus Budil had two display cases, the first with a very fine selection of specimens, with a large Beryl on the right with a blue Aquamarine centre and a pink Morganite rim. 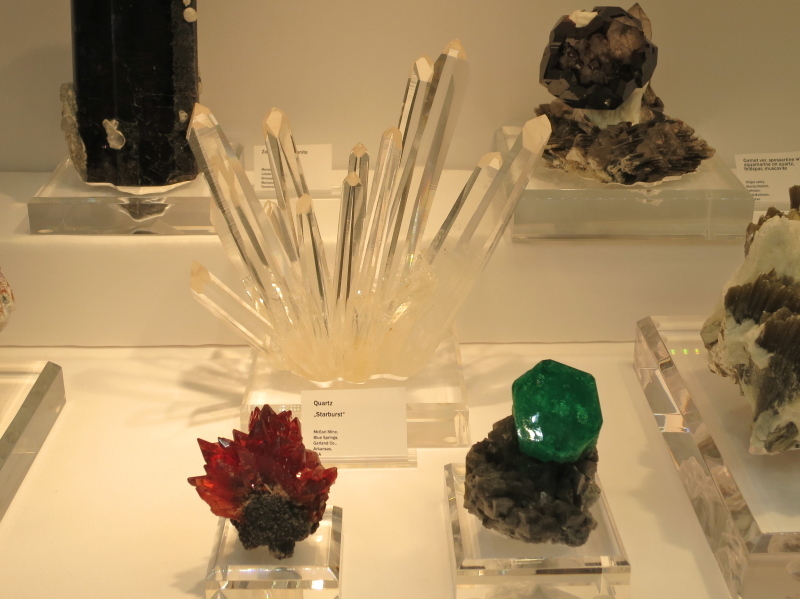 A closeup of the very gemmy starburst Quartz specimen from McEarl Mine, Arkansas with a Rhodochrosite from Hotazel Mine, South Africa and an amazing Emerald from Colombia – the crystal was approx 5cm wide by 10cm long with the best colour and very lustrous termination. 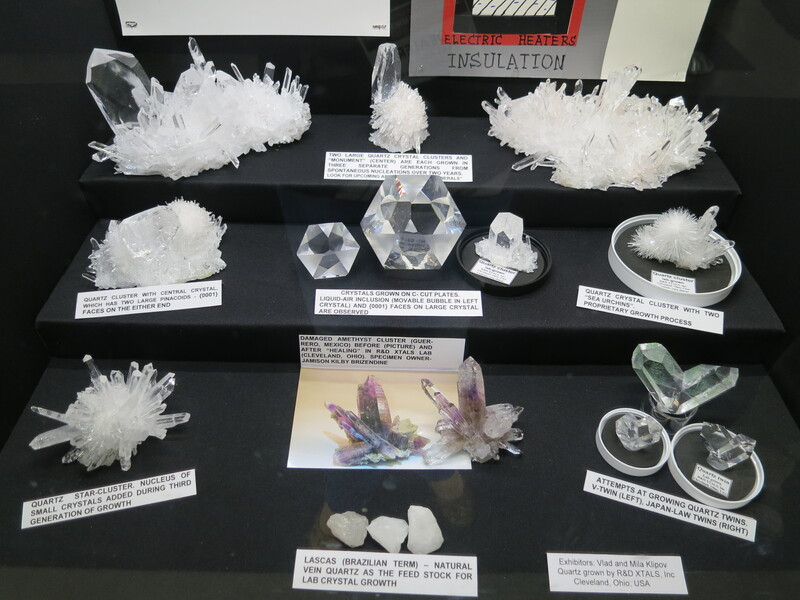 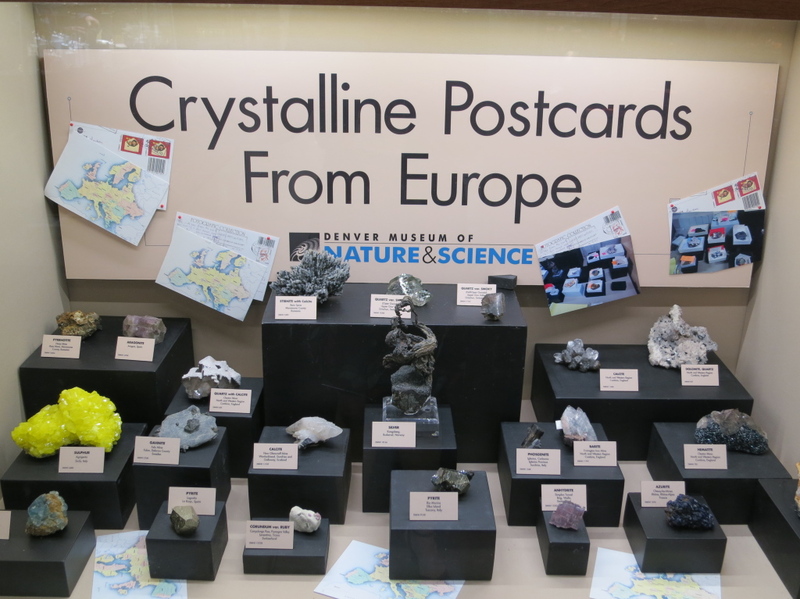 Quartz has featured heavily at this show, both in the new finds and the special displays, fitting nicely with the Western Europe theme with many Alpine Quartzes. 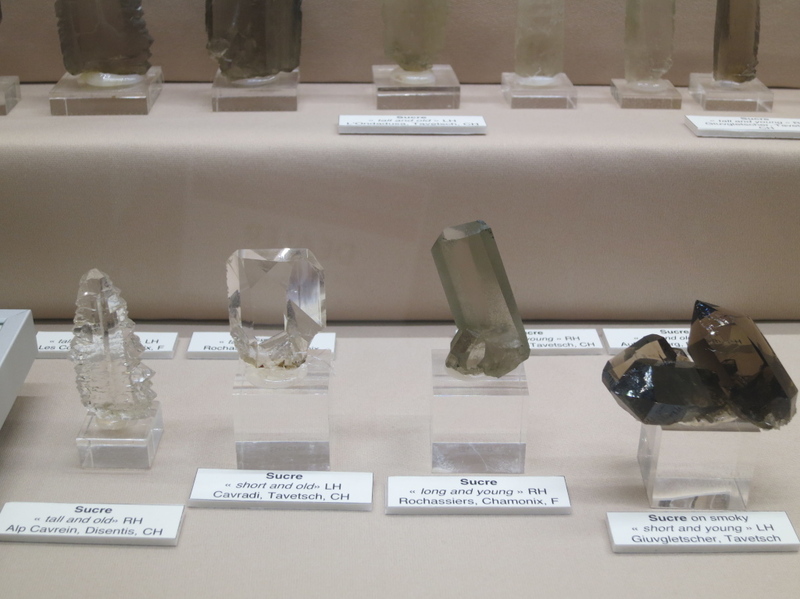 Marcus had a second cabinet with a selection of superb Quartz from Switzerland including Gwindels and gemmy prismatic Smoky Quartz. 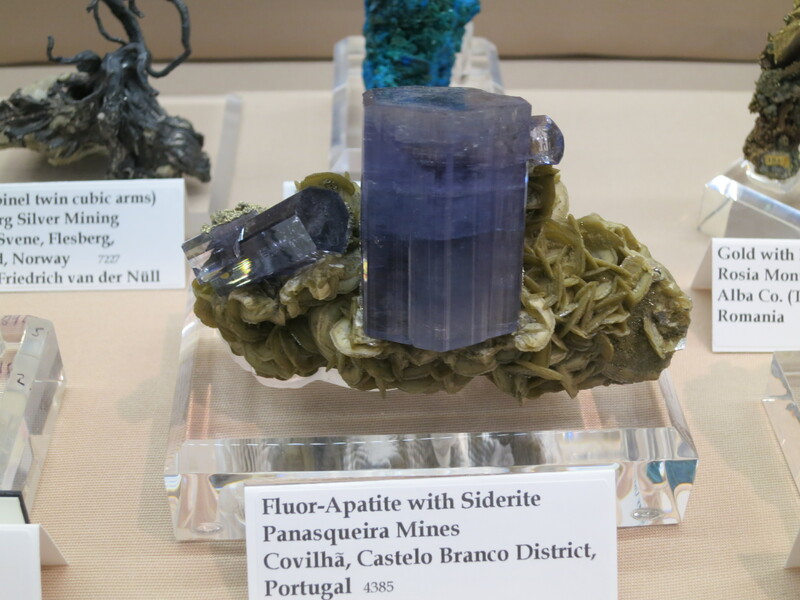 Siber + Siber of Switzerland also featured a case of minerals from the Swiss Alps, with many superb Quartz specimens, plus pink Fluorites and Hematites. Next to the Siber’s case was this excellent display of Quartz Gwindels, nicknamed Sucres (or Sugar in English) as they were thought to resemble French style sugar lumps in the 1960s by crystal hunters in Chamonix. 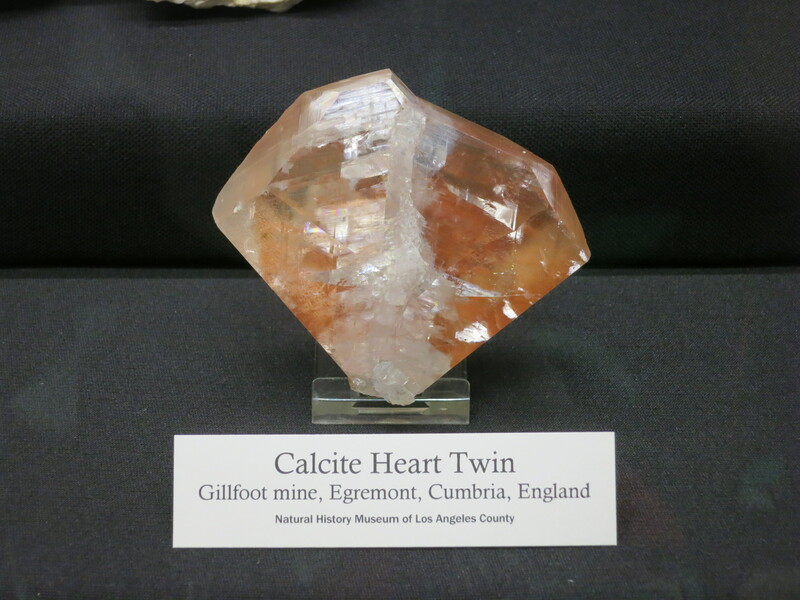 The understanding of Gwindel growth is relatively new, and this case did an excellent job at explaining it with examples of young Gwindels (first growth of a tall and twisted seed) and old Gwindels (when the seed has been entombed by a subsequent larger growth forming a holotaxial envelope). 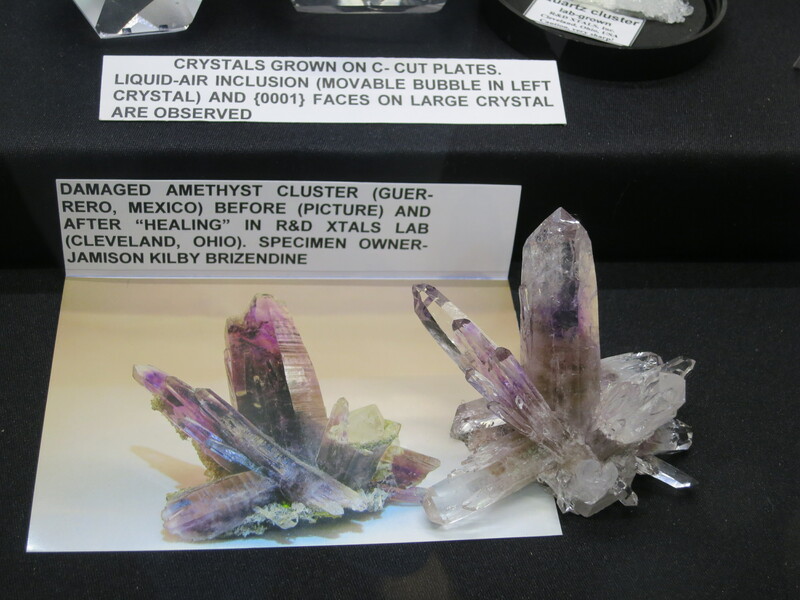 The young crystals have straight edges, and the older ones the well recognised serrated edges. 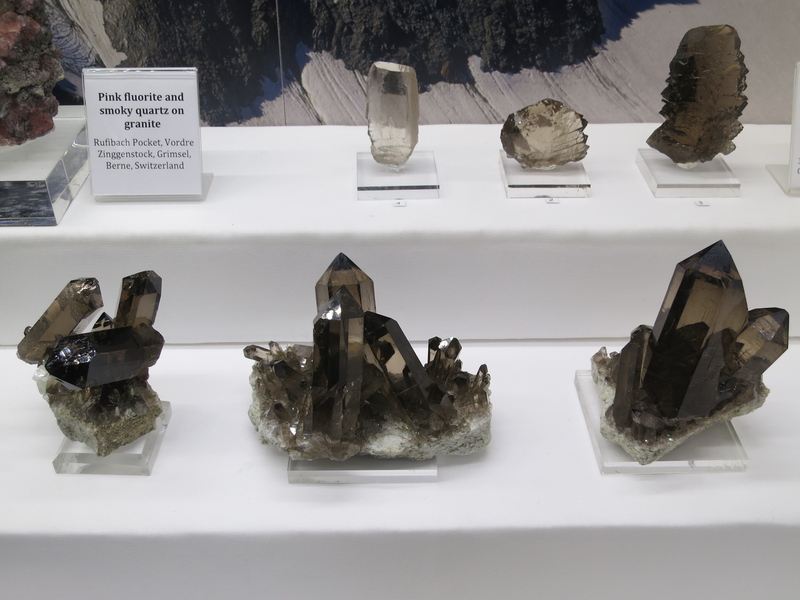 A closeup showing (L to R) tall and old, short and old, long and young, short and young. In one section of the special exhibits it was the Great Quartz Crystal Face-off, with many displays showing the wide variety of forms and colours of this common mineral. 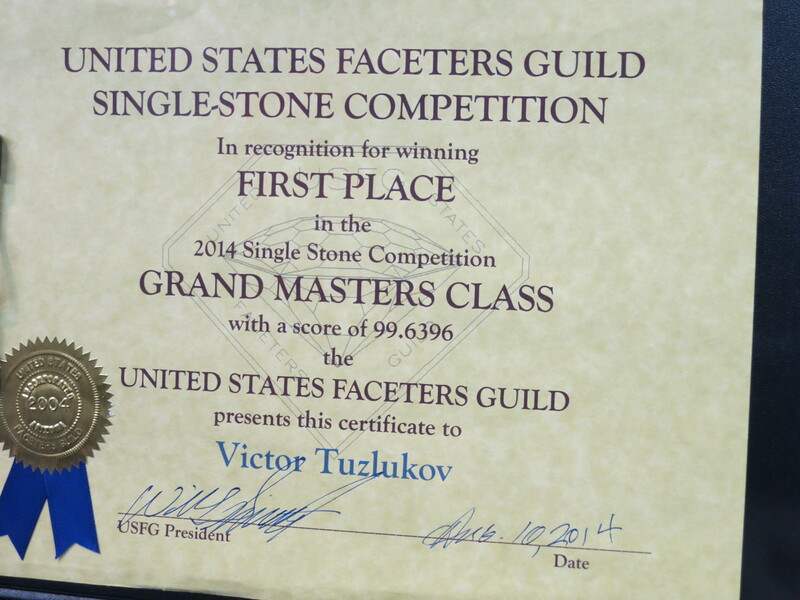 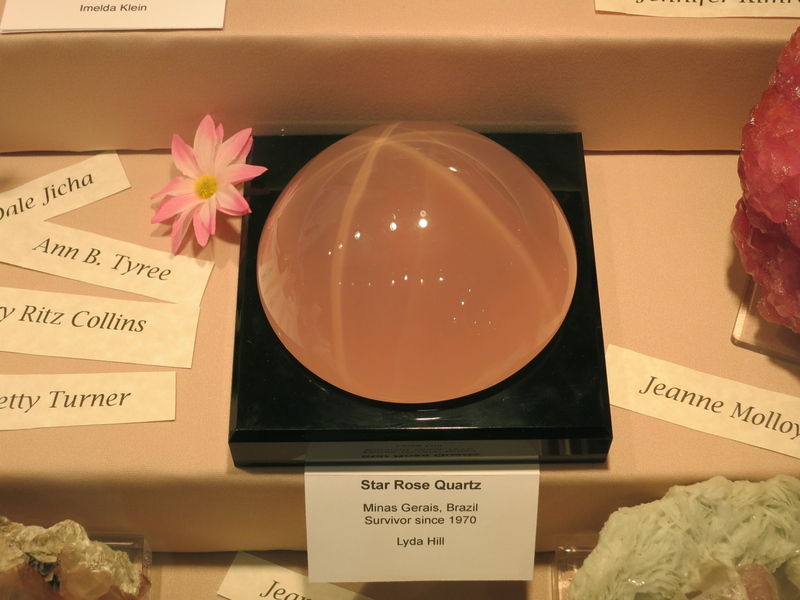 There is something very appealing about Quartz, and the variety makes it very popular with many collectors. 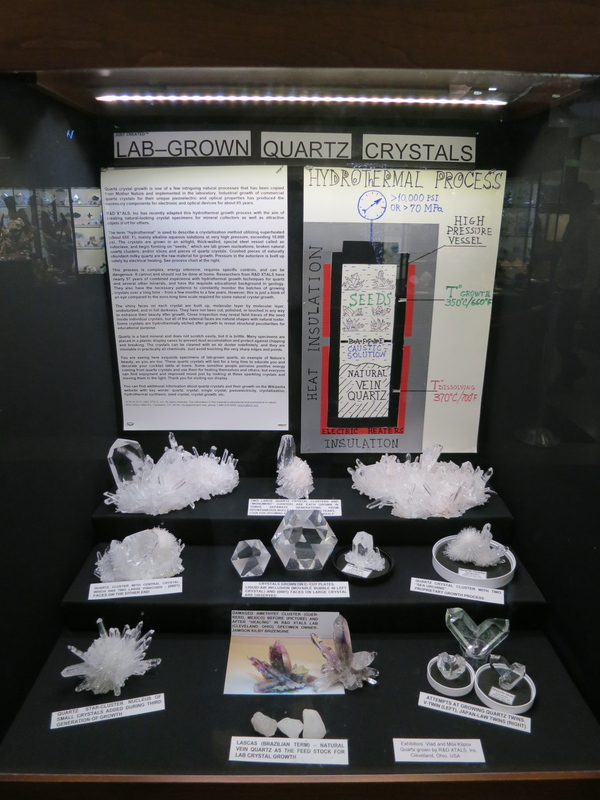 One very interesting case was this display of lab grown Quartz, using the hydrothermal method. 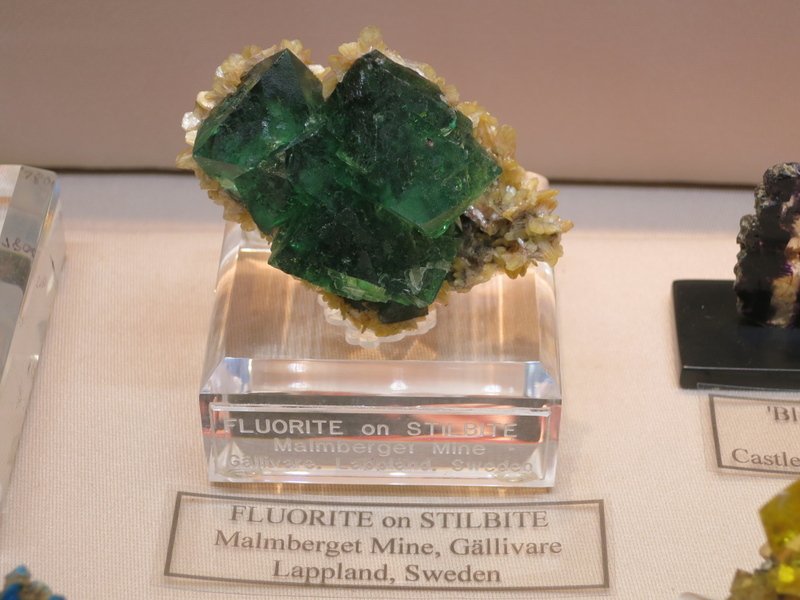 This really gives you pause for thought to see the quality of the ‘specimen’ that can be grown – some of these you would not think twice about if you saw it for sale. 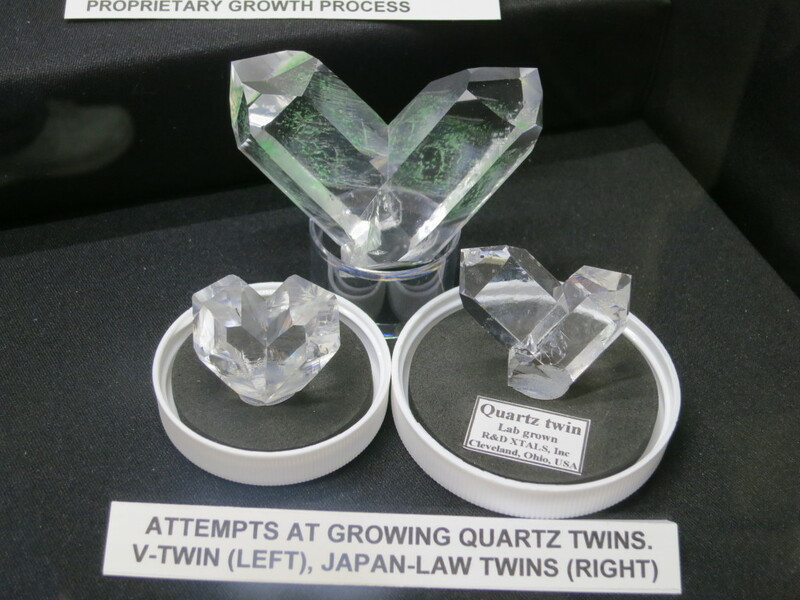 There were even attempts at growing Japan Law twins, and a natural Amethyst specimen from Guerrero that they had ‘rehealed’ and regrown the tip of a damaged crystal. 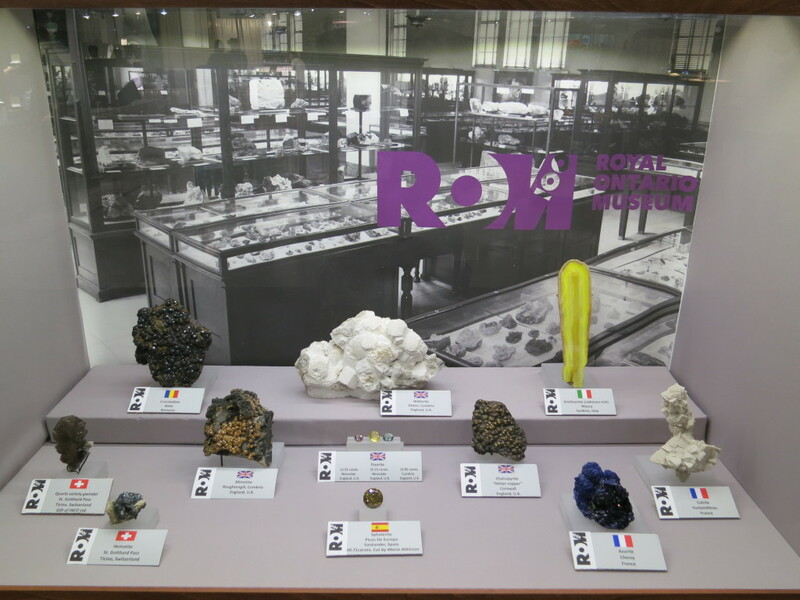 Onto the special exhibits with the theme of ‘Minerals of Western Europe’. 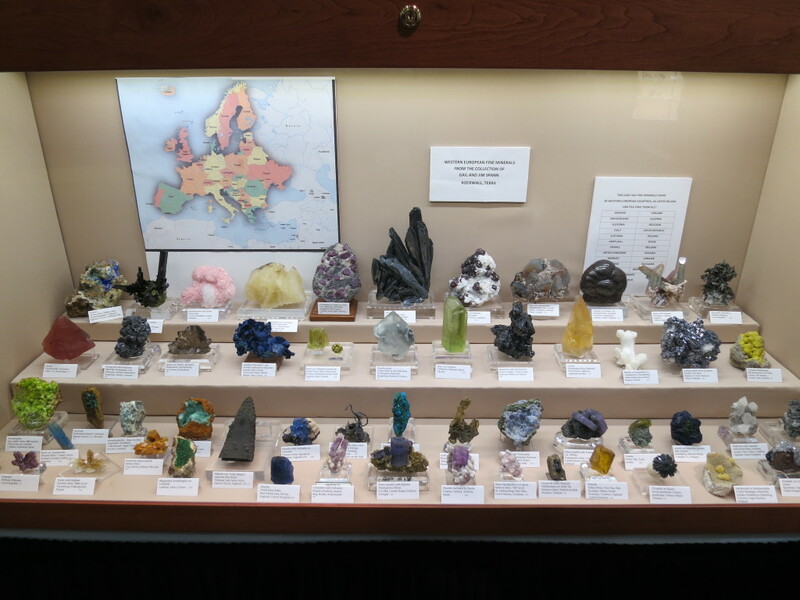 This has been an excellent choice of theme bringing out a very wide selection of minerals including many exceptional specimens for the species and/or location. 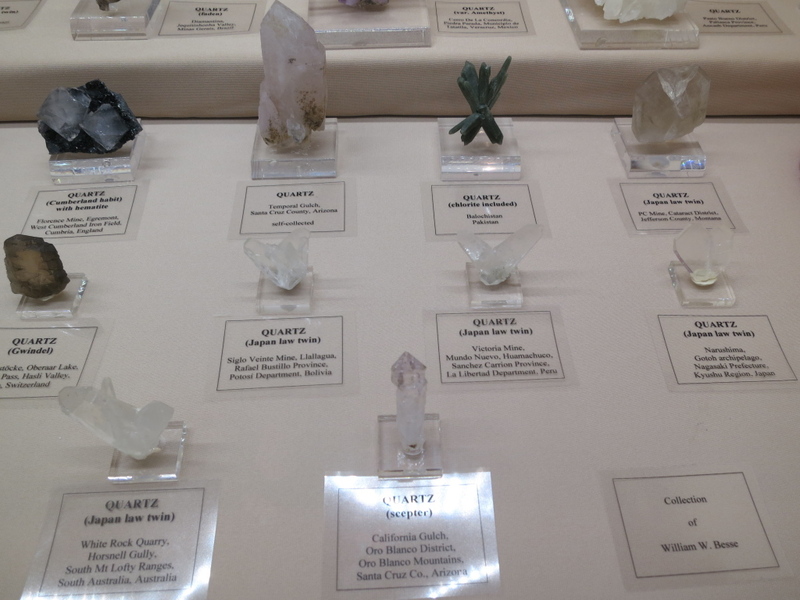 Many of these minerals are not the prettiest or flashiest for display but there were some outstanding pieces, with quality far exceeding what you commonly see for sale. 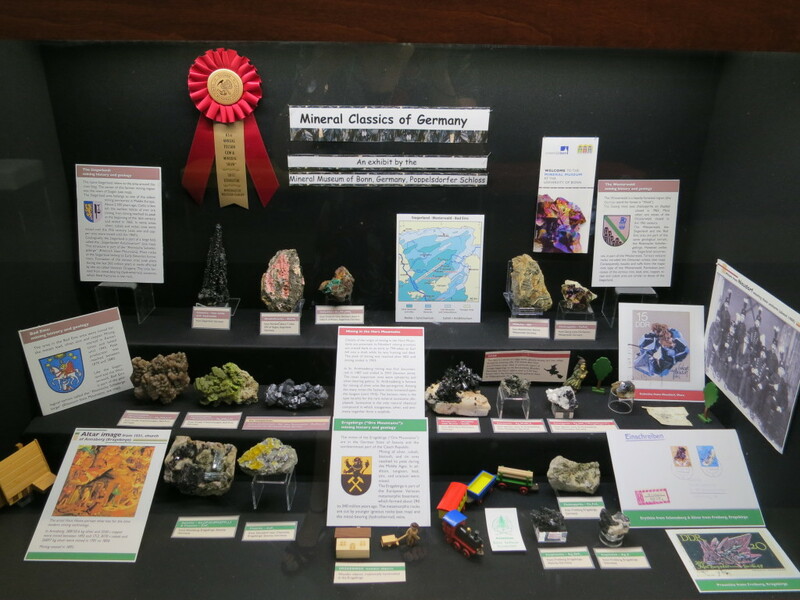 The mineral chosen for this year’s show poster was an Epidote from Knappenwald, Austria from the collection of the Natural History Museum of LA County, California and it was here on display. 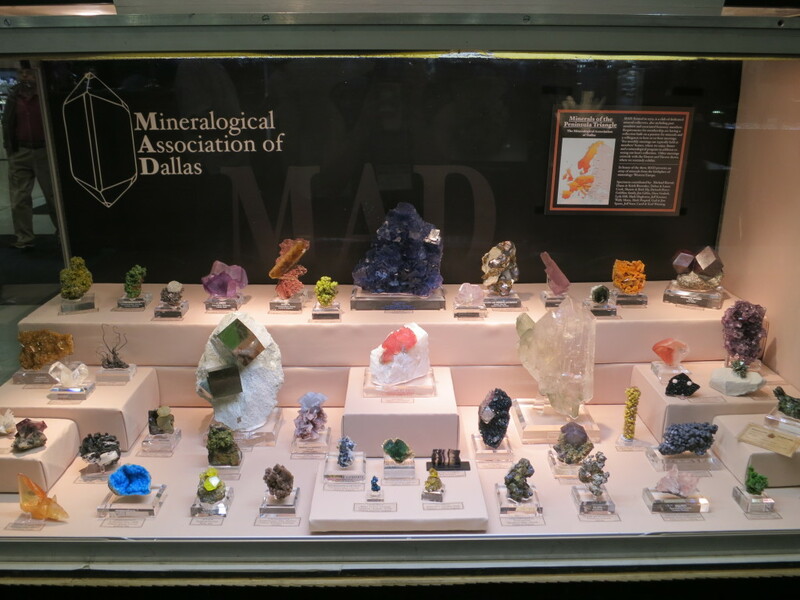 The Mineral Assocation of Dallas (MAD) are guaranteed to put on a display of superb specimens, and did not disappoint with their Minerals of Western Europe. 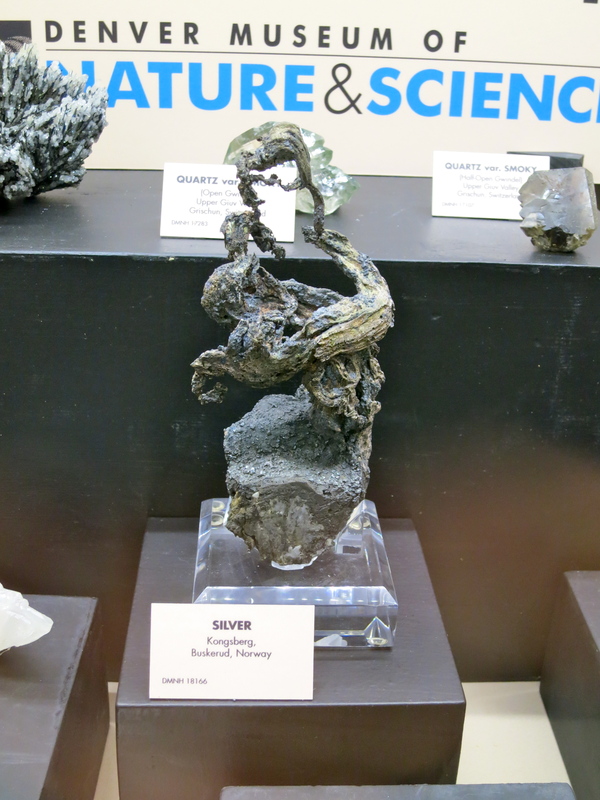 Next to the MAD display was a wonderful display from the Krugerhaus, part of the Bergakademie Freiberg of Germany. 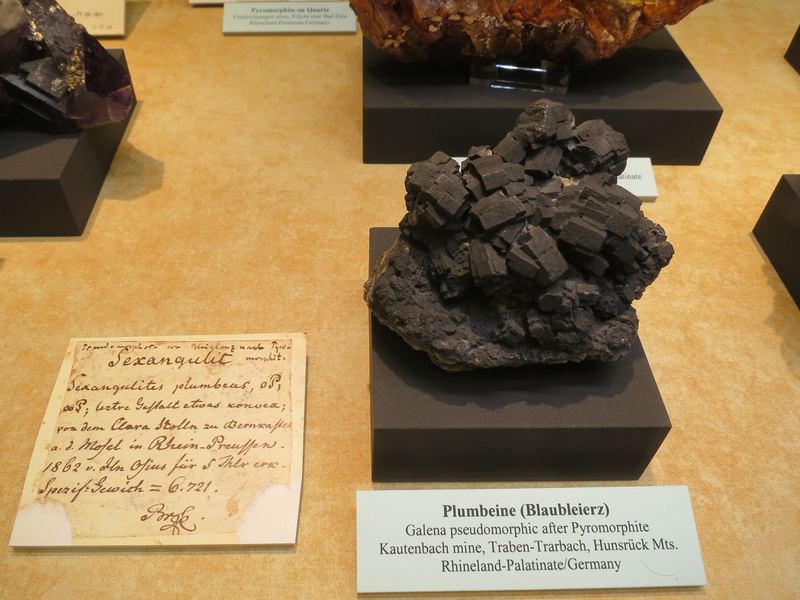 The Krugerhaus houses the ‘Mineralogical Collection of Germany’, and the exhibition opened to the public in 2012. 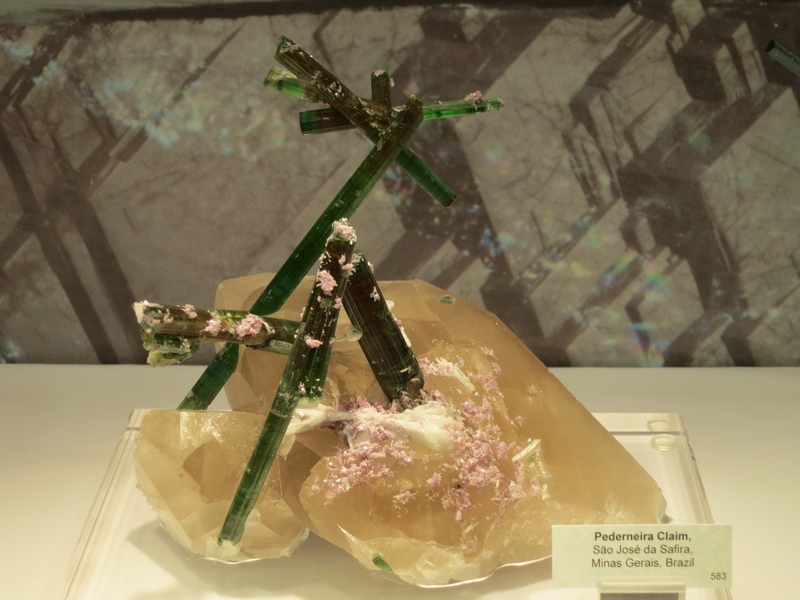 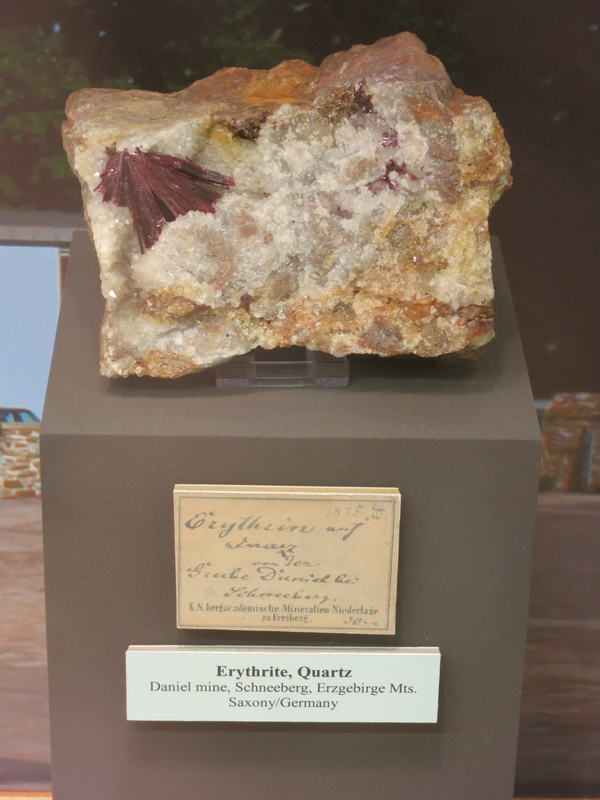 This exhibition together with the minerals from the collection at the Bergakademie and in the terra mineralia exhibition in Freudenstein Castle comprise one of the best and most extensive collections worldwide – a visit to Freiberg to see them is a must for every mineral collector. 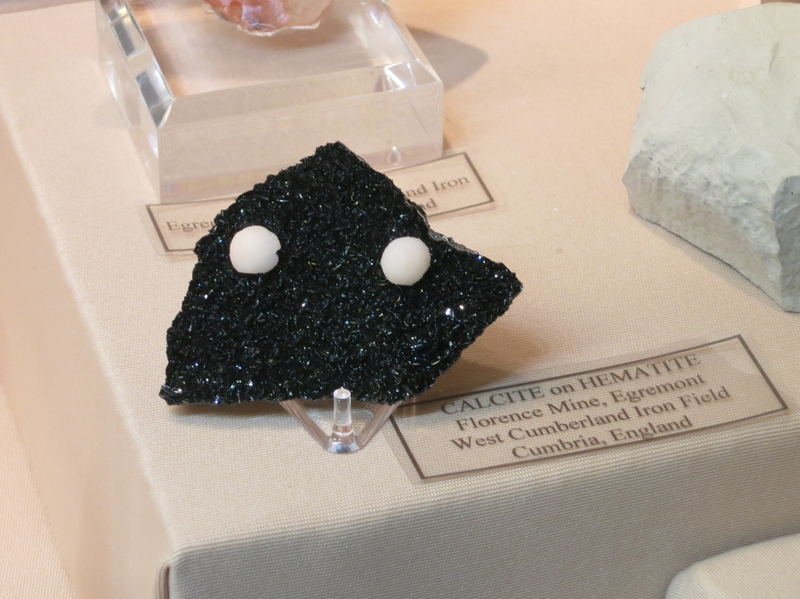 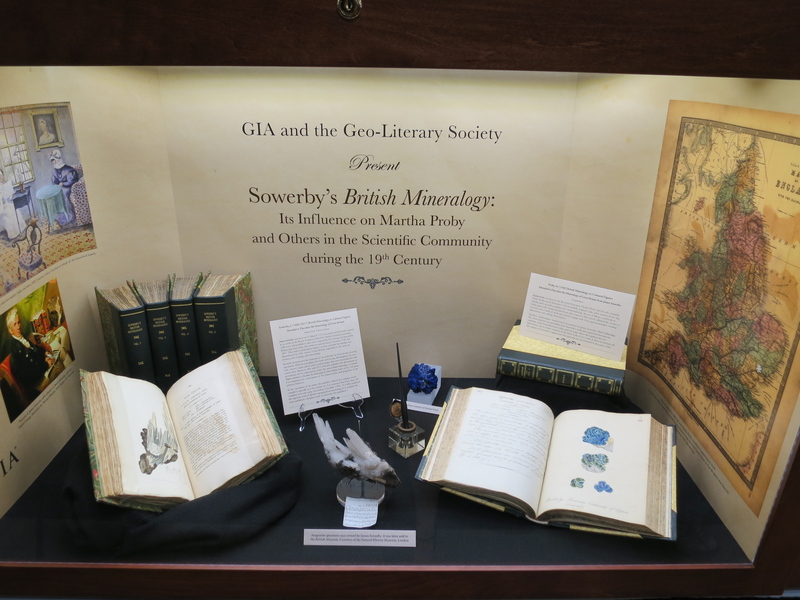 The GIA (Gemological Institute of America) and the Geo-Literary Society had a display of Sowerby’s British Mineralogy. Sowerby’s illustrations document minerals of Great Britain, and were published as periodicals between 1802 to 1817. 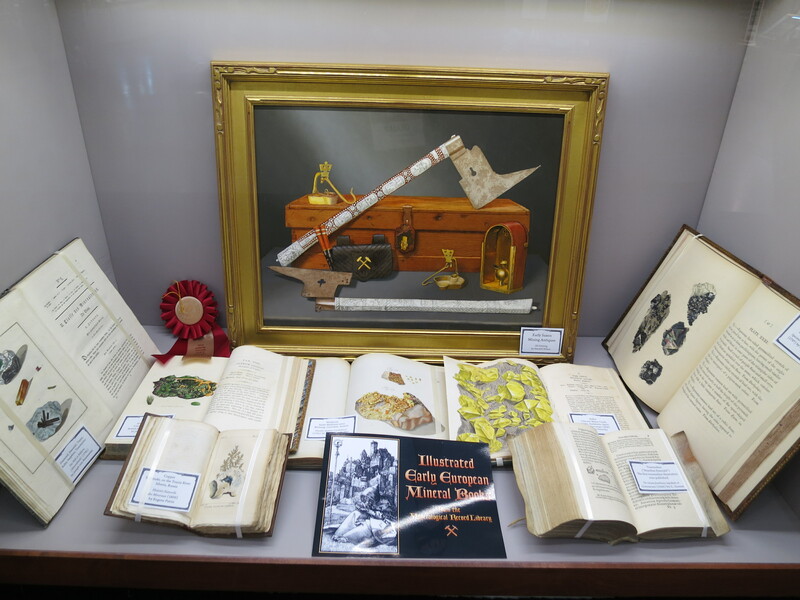 At the conclusion, the publishers offered a compiled complete works, typically as a 5 volume set. 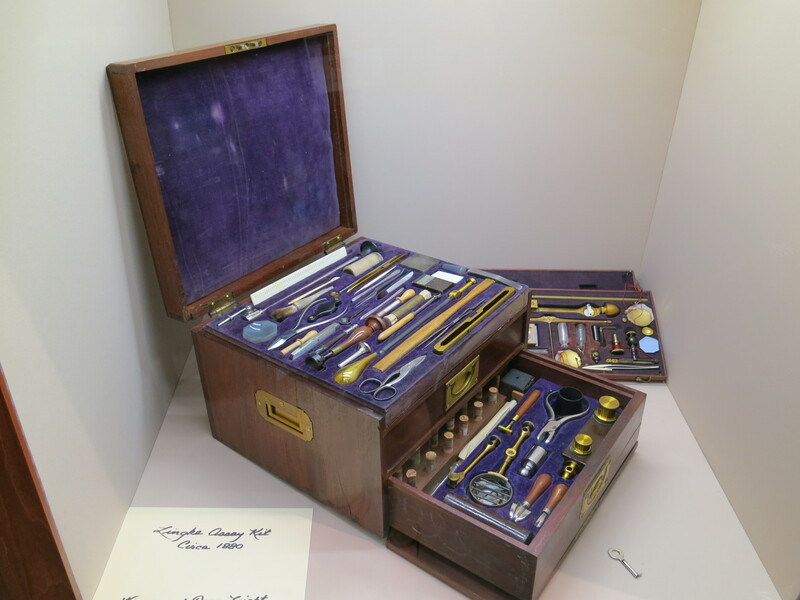 It is thought there are fewer than 100 of these complete 5 volume sets in existence today. 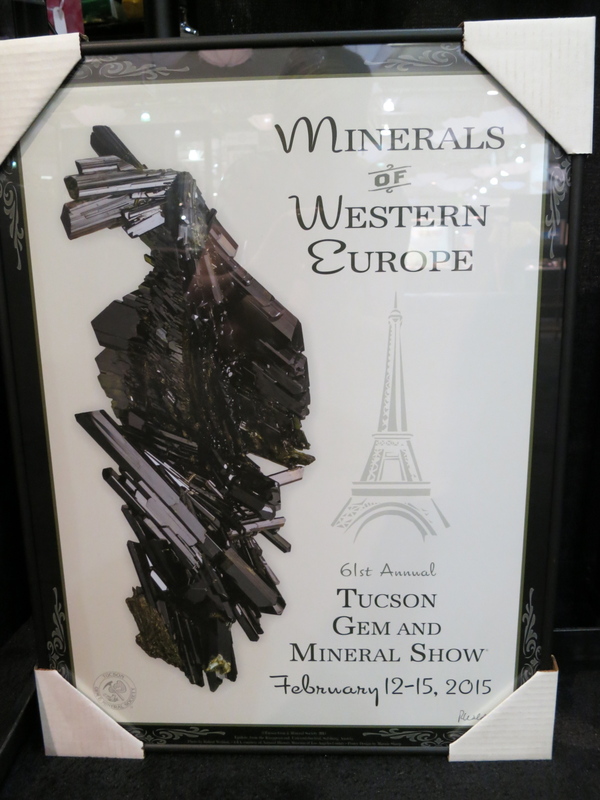 There are also many competition displays at the show. 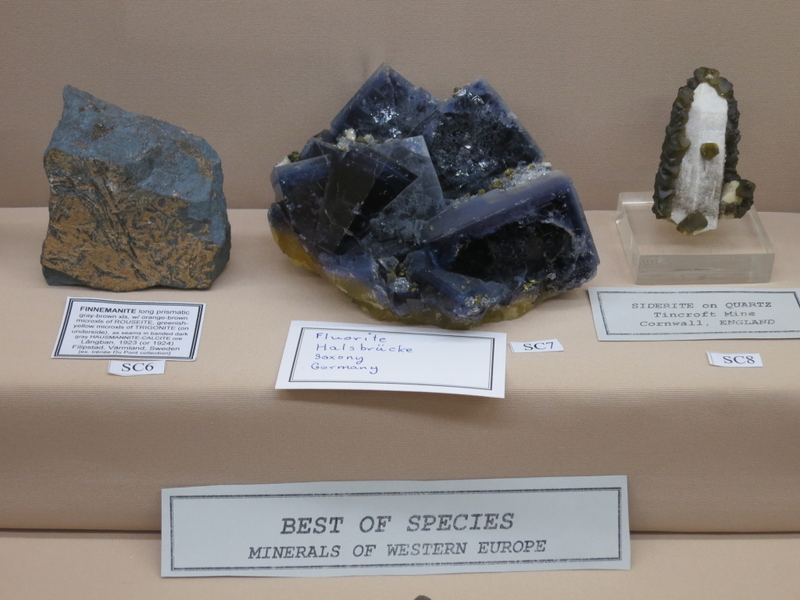 Many were based on the show theme, including a competition for best of species. 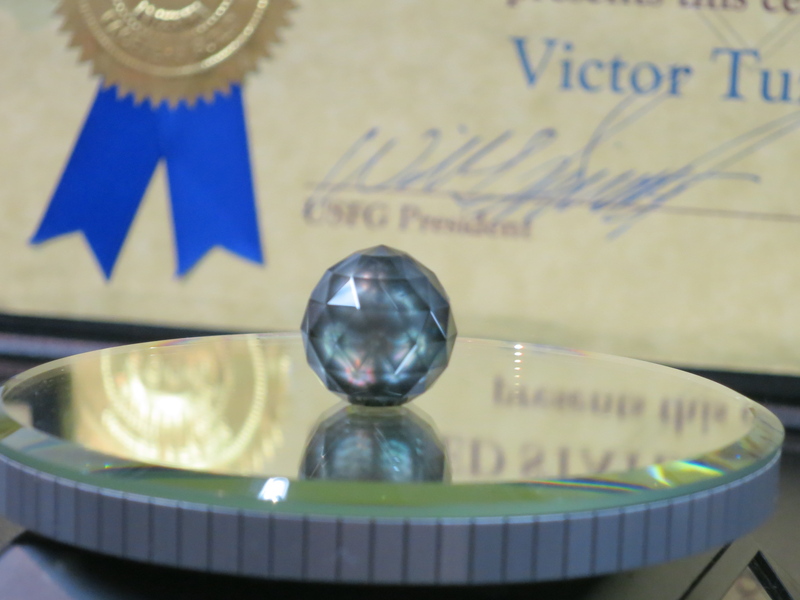 And there were many other displays including this awesome faceted pearl, which unsurprisingly won first place in the single stone faceting competition 2014. 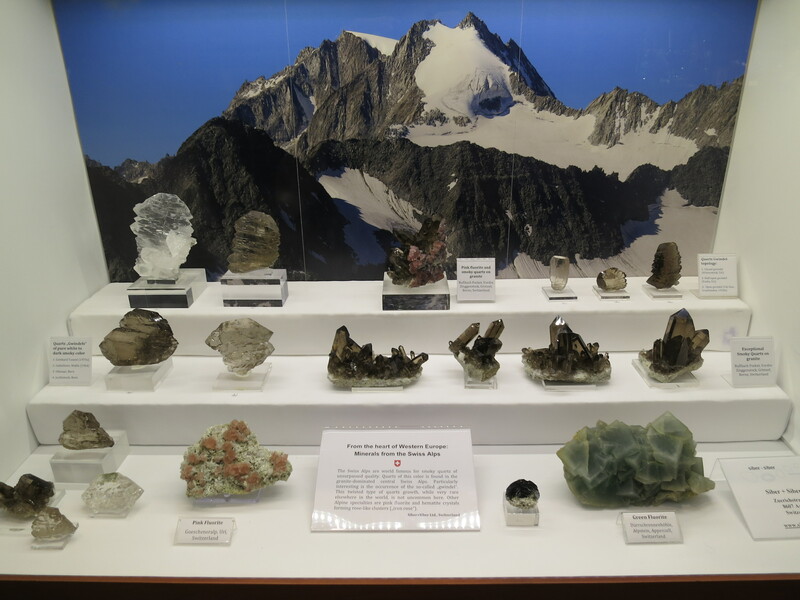 One of the definite highlights of the show was the display of Amazonite Feldspar and Smoky Quartz specimens found by the guys at Pinnacle 5/ Glacier Mining. 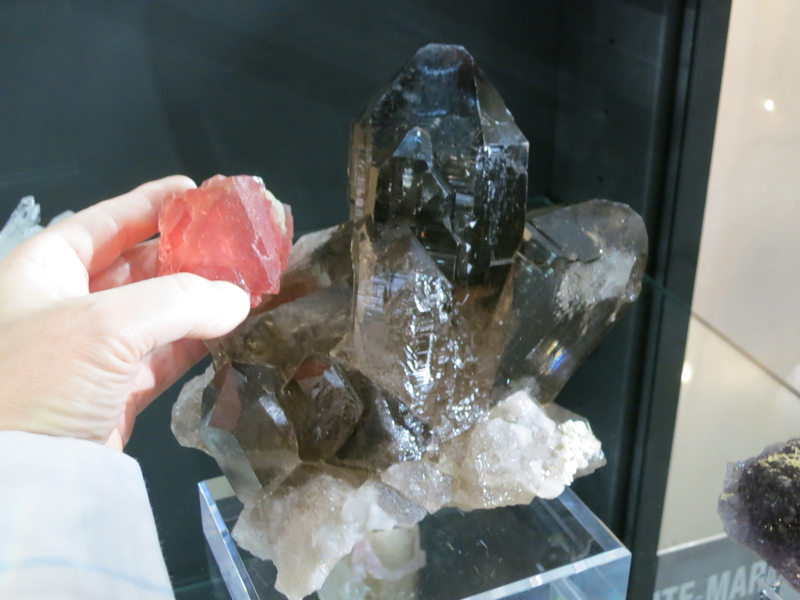 These crystals were found in the Icon Pocket of the Smoky Hawk Claim, Teller Co., Colorado in June 2012. 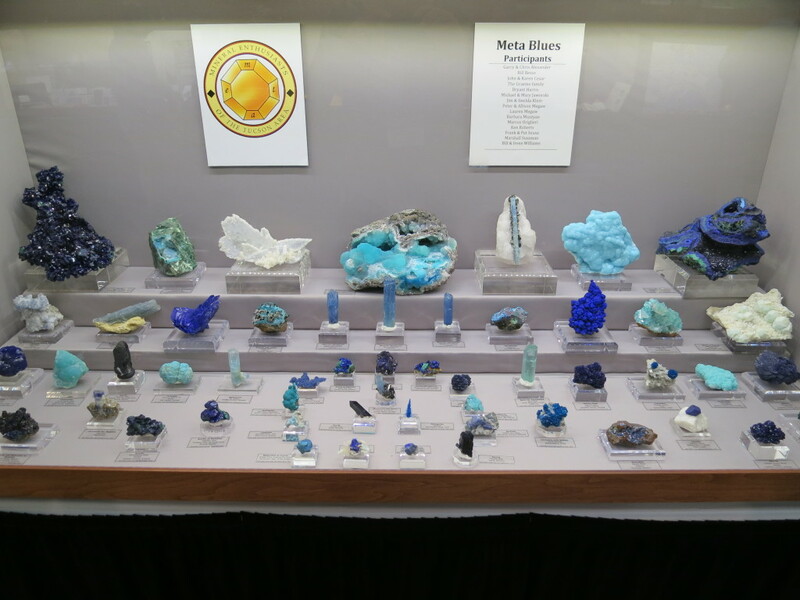 It took almost a month to collect the pocket with approx 300,000 crystals and fragments, and over a two year period the crystals and fragments were washed, cleaned, laid out and painstakingly pieced back together, completed mostly by Tim Dorris. 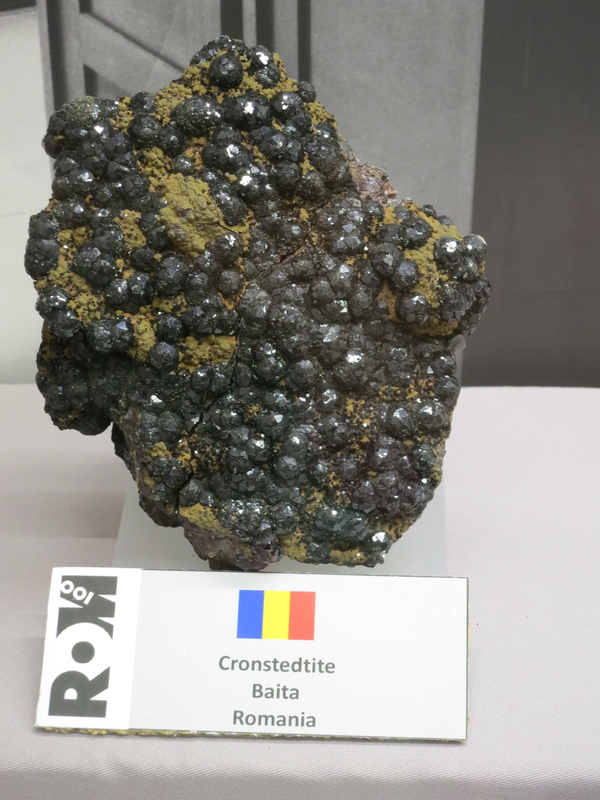 He succeeded in reconstructing this plate which is the largest plate ever found. 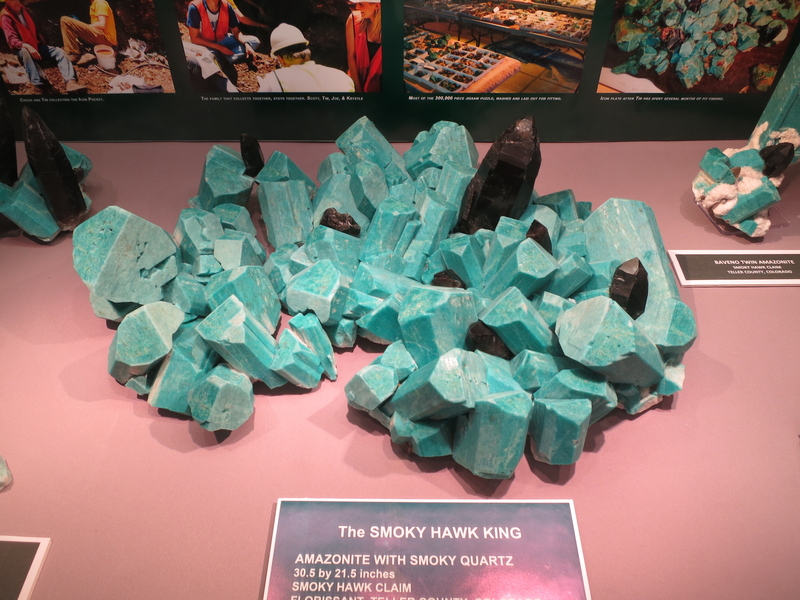 The crystals of Amazonite are themselves huge measuring over 20cm in length, when they normally average around 5cm. 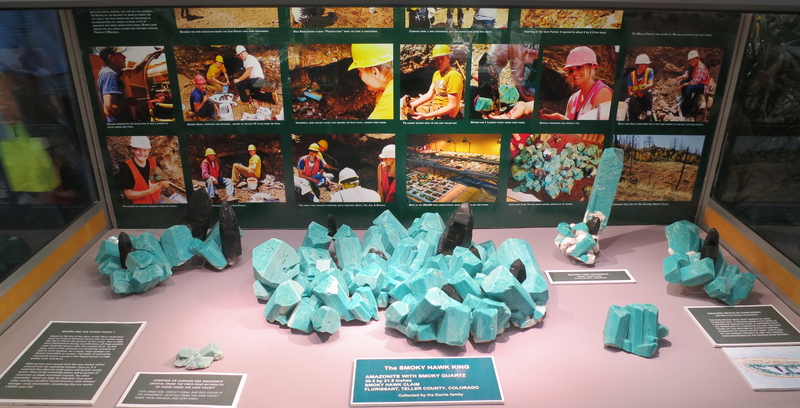 This is the best find of Amazonite in 140 years of mining in Colorado. 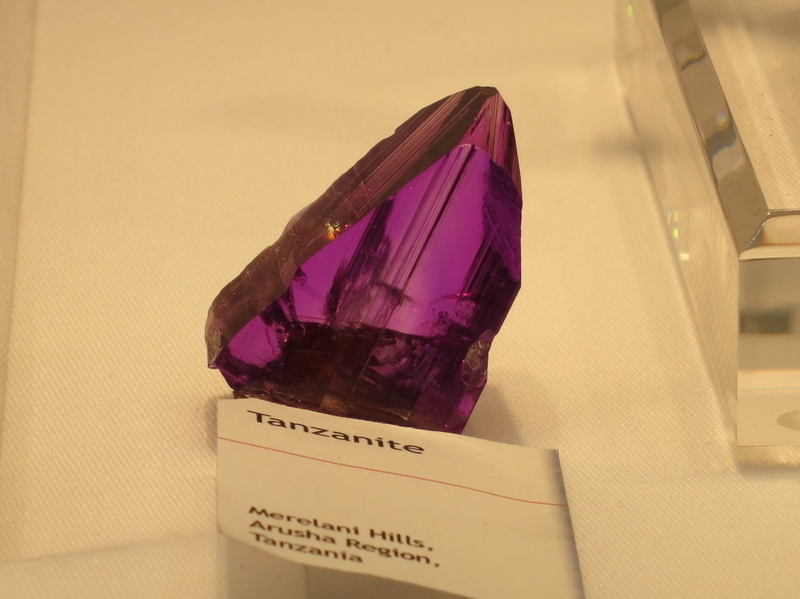 Other large groups are still being prepared. 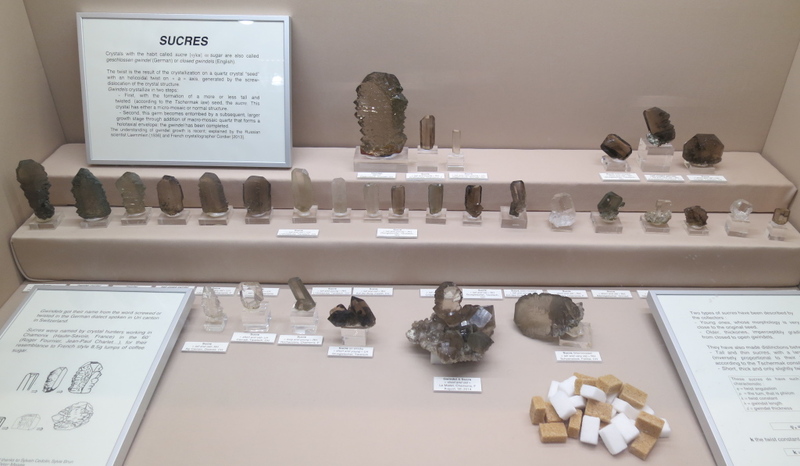 Several reconstructed plates of Amazonite and Smoky Quartz from the Icon Pocket, Smoky Hawk Claim, Teller Co., Colorado. 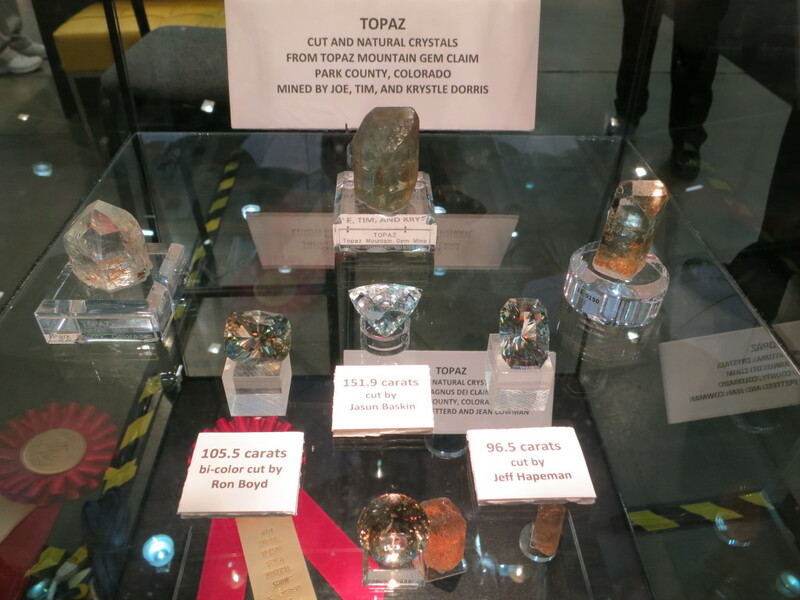 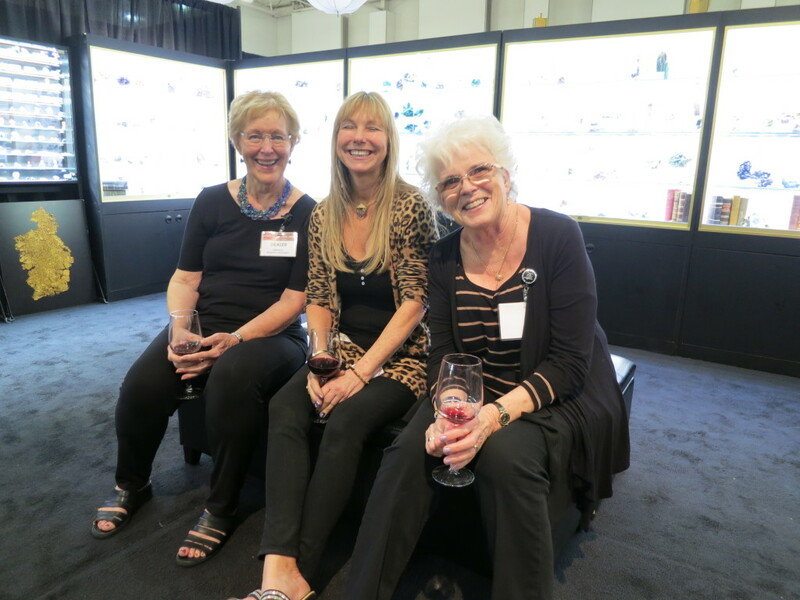 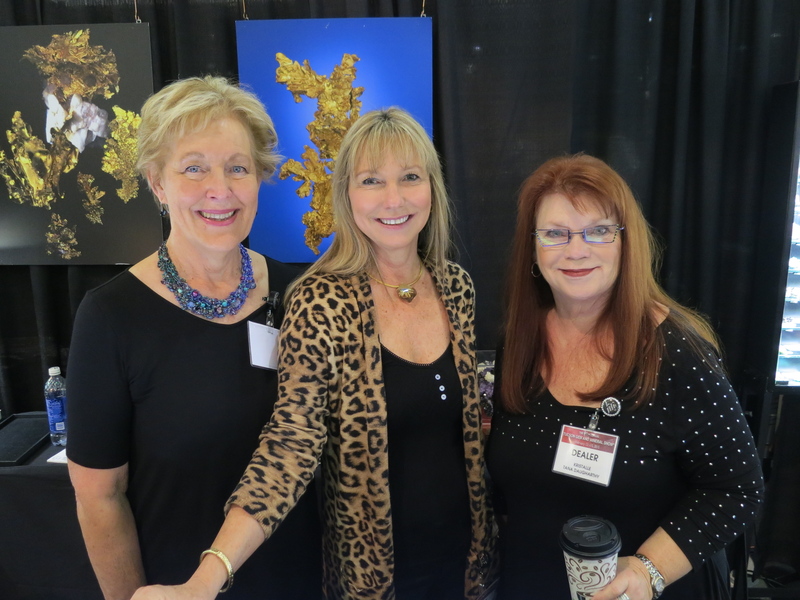 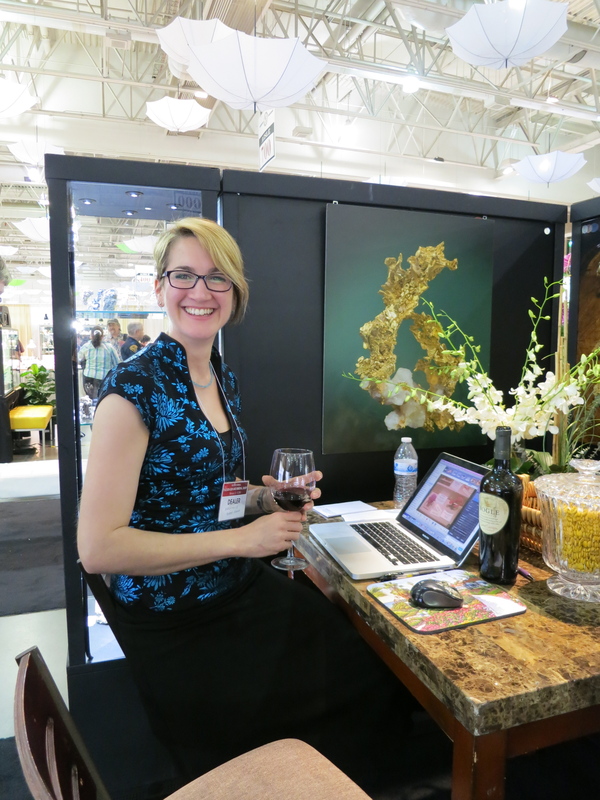 The Pinnacle 5 team also had a display of some of their Topaz crystals and cut beautiful gemstones. 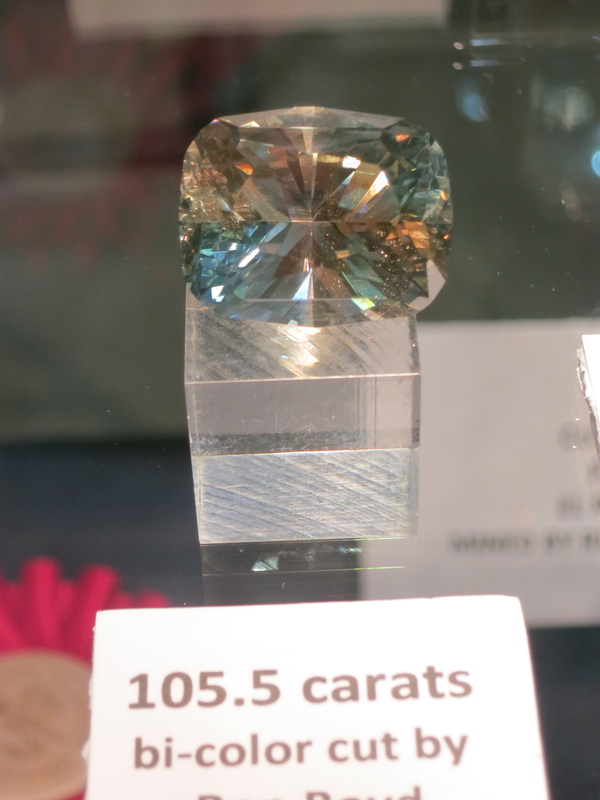 Gerhard Wagner had several displays of drool worthy Tourmalines. 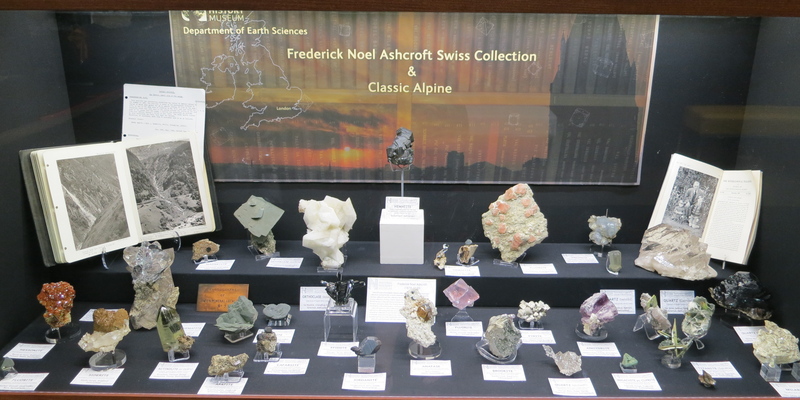 This is a small selection from his collection of more than 400 specimens which he has collected over 25 years. 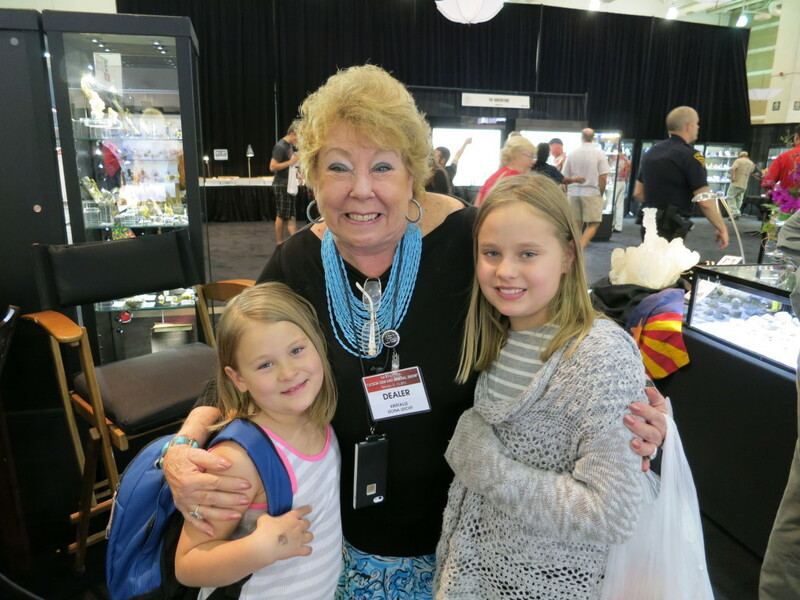 Dona with the lovely Lilly and Emma Pearson from New Mexico who bring Dona pistachio nuts each year. The theme for next year’s show is ‘Shades of Blue’ so we will leave you with this display case from the Mineral Enthusiasts of the Tucson Area to get you into the mood. 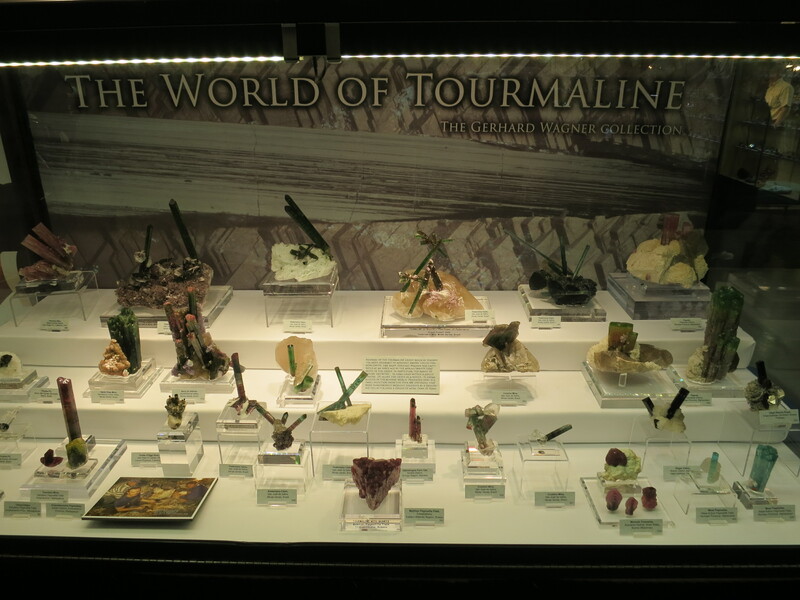 Our next post will be an overview of the show!